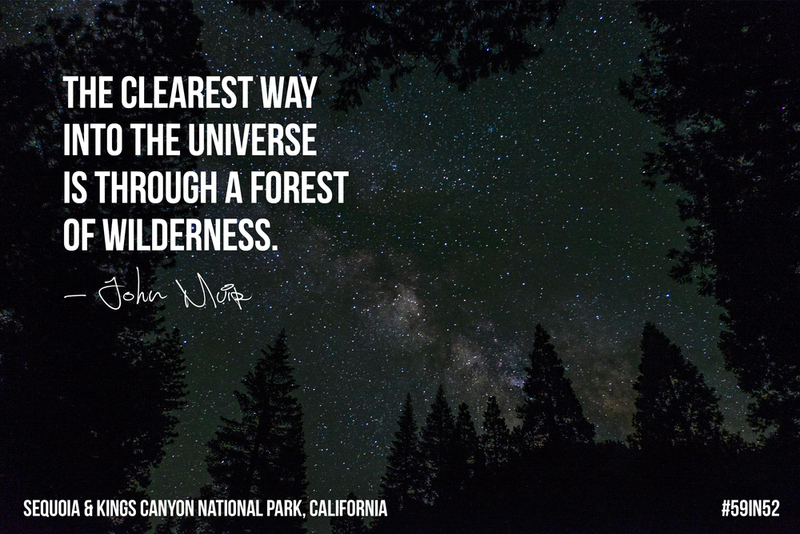 It was in the California wilderness where John Muir, the unofficial “father of the national parks,” was inspired to start down a lifelong path of environmental conservation—and it was the landscapes of Sequoia and Kings Canyon and surrounding areas that so compelled him. 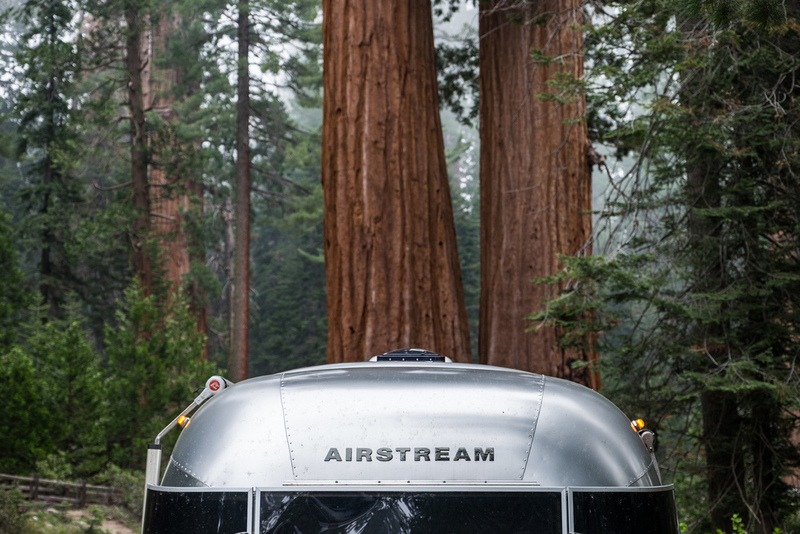 He once called Kings Canyon “a rival to Yosemite” (and we all know how much he loved Yosemite); he likened the ancient sequoia trees to picture windows into history. 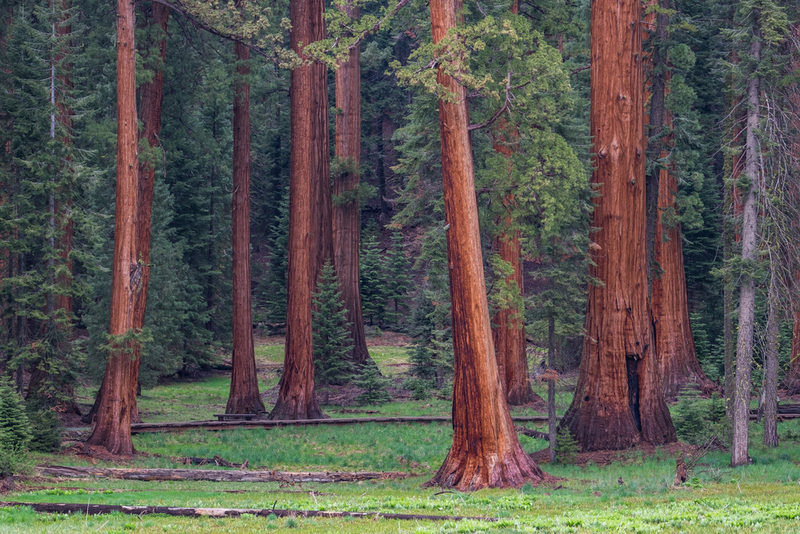 Muir succeeded in bringing Sequoia to national park status, it would become America's second national park just after Yellowstone was created in 1890. 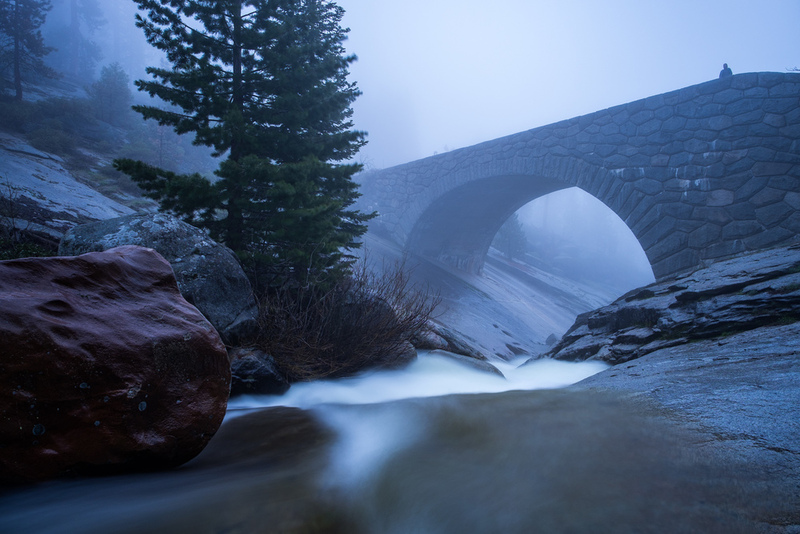 His attempts to bring the neighboring area of the Kings River into the fold ultimately failed, but five decades later after successful lobbying efforts were made by the President, the Interior Secretary, and a talented photographer named Ansel Adams, Kings Canyon officially joined the party. So here we have two separate national parks joined at the hip, very different and with one big thing in common—size. 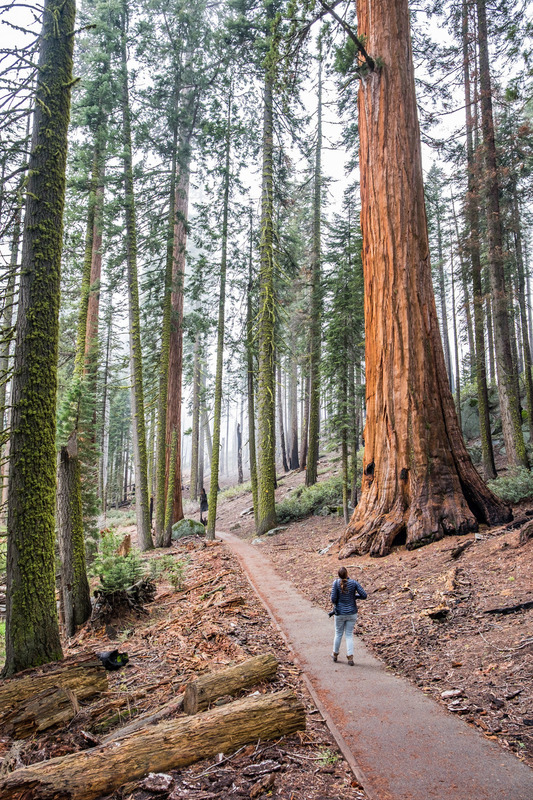 Sequoia National Park has the largest tree on Earth by volume stationed within its boundaries, it's name is General Sherman. 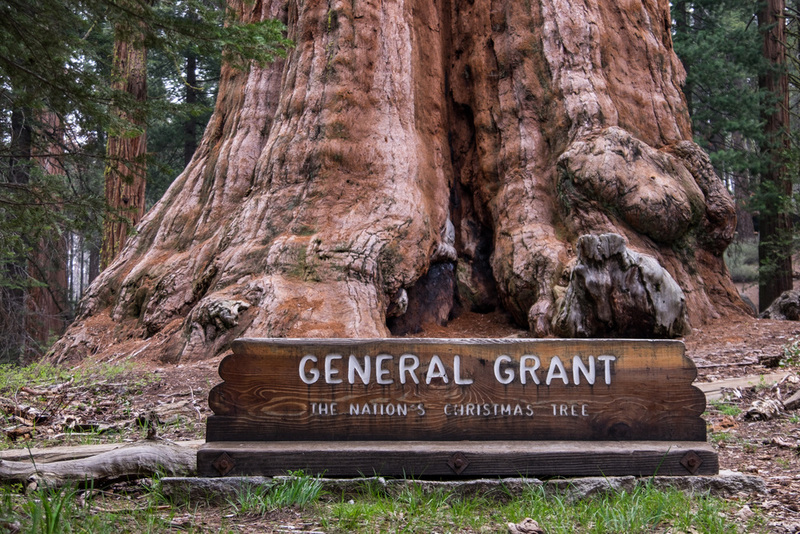 Kings Canyon is home to one of North America’s largest (and most beautiful) canyons, and to the world's second largest tree, General Grant. 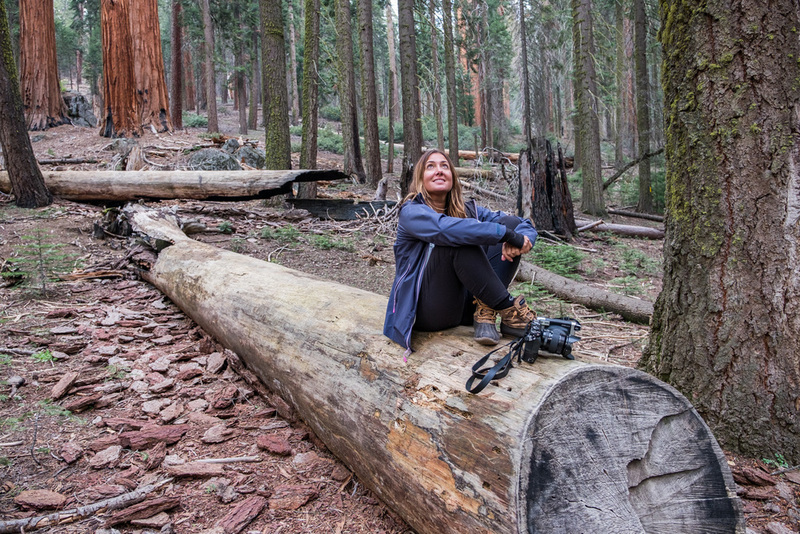 Needless to say, we had completely unique experiences in each of the parks as we're sure many others did who took time off of work or school or life to have their tree-hugging, nature-loving minds blown by the California wilderness. 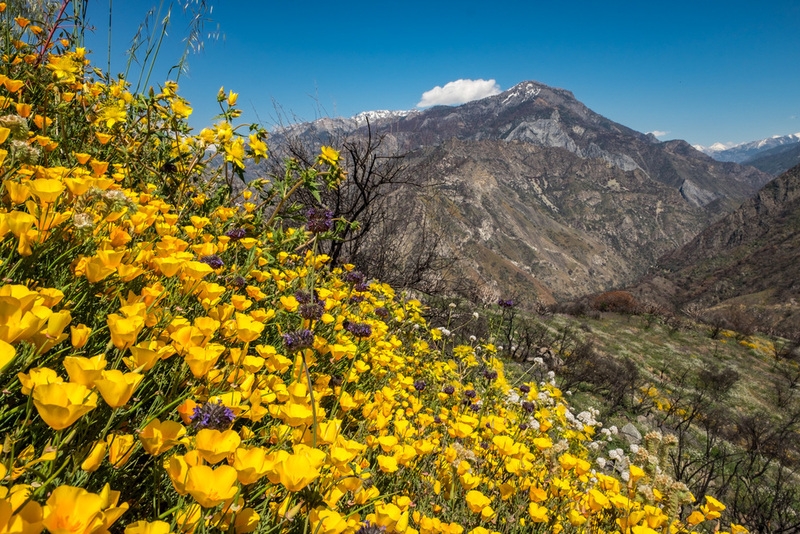 Since the formation of Kings Canyon, they have been administered jointly by the U.S. National Park Service (NPS), and it is for that reason that we are giving them the same treatment by presenting them together on this page. 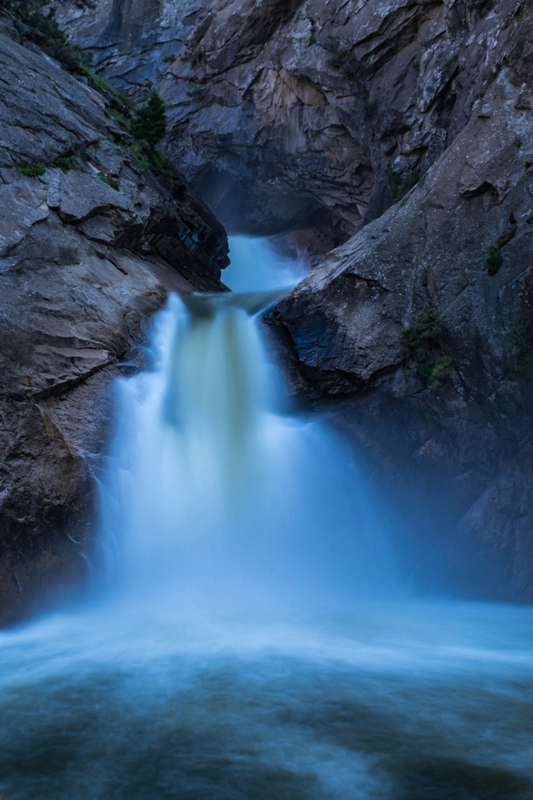 Below we've outlined some of our favorite places to go and things to seek out in parks 22 & 23 on our great American road trip. 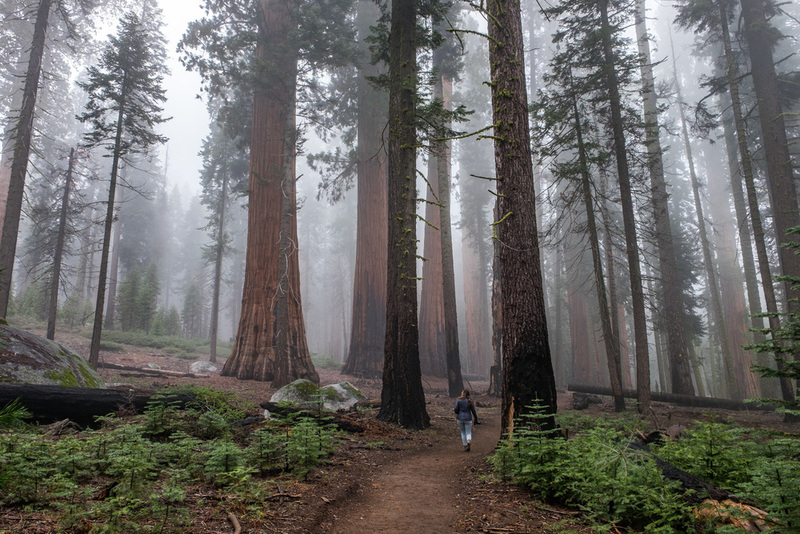 You'll know as you begin to enter the Giant Forest from the warm color and the massive size of the sequoia trees. The Giant Forest is the unofficial entrance to heart of the park. 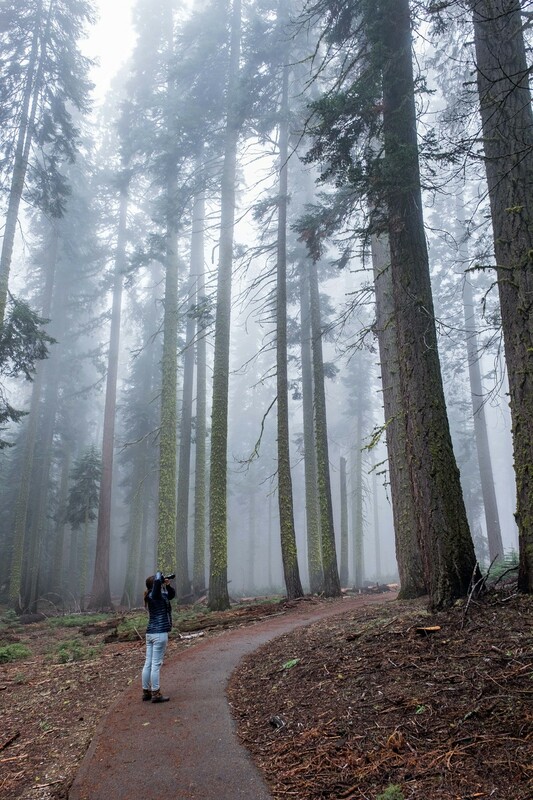 You will know you’ve reached it when the conifer forests of pine, fur, and cedar suddenly intersperse with the world tallest trees (redwoods) and largest trees, sequoias. 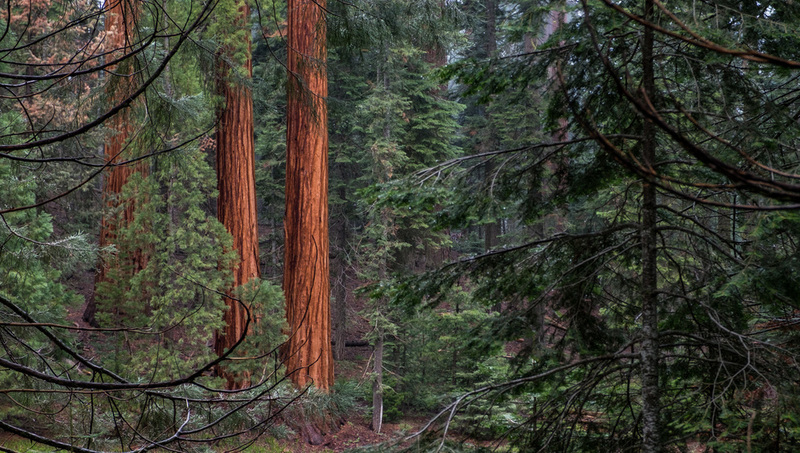 It a spectacular and unmistakable entrance—the trunks of sequoia trees are twice the size of anything nearby and they are richly colored with amber bark, a sight that lights up the deep dark forest. 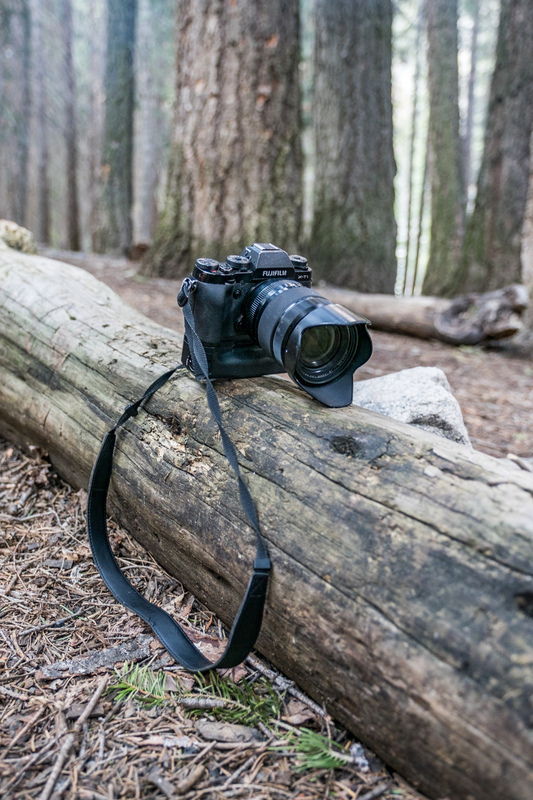 There are plenty of places in the area to pull off and wander through the trees on foot, or, you can simply enjoy the view from inside of your car window. 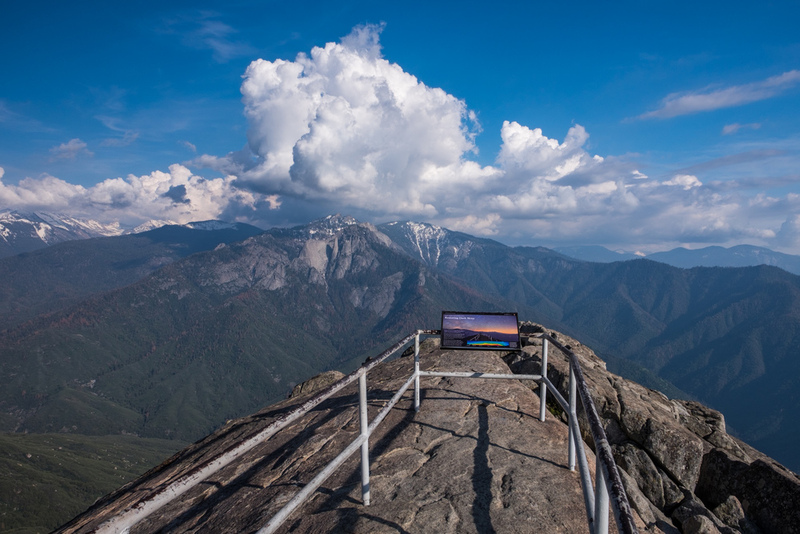 Most visitors spend a lot of time driving in and around the Giant Forest en route to other famous landmarks in the park, including Moro Rock and Tunnel Log. 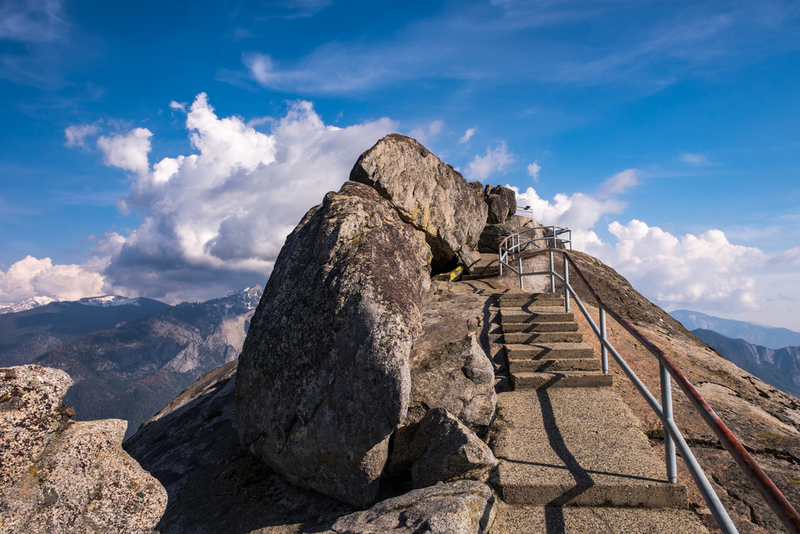 View from atop Moro Rock. 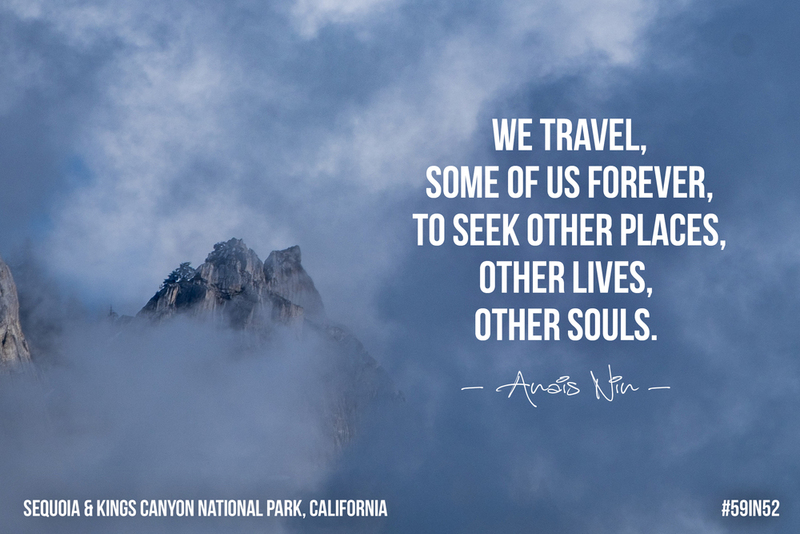 This granite stone formation is one of the crowned jewels in Sequoia National Park and a longstanding visitor favorite. It was one of the first landmarks to be cultivated after the Giant Forest was established. Just 400 laddered steps up a rock face (those who fear exposure, beware!) you will find yourself among towering views of the Great Western Divide where you will get a load of the best sweeping views of any accessible place in the park. 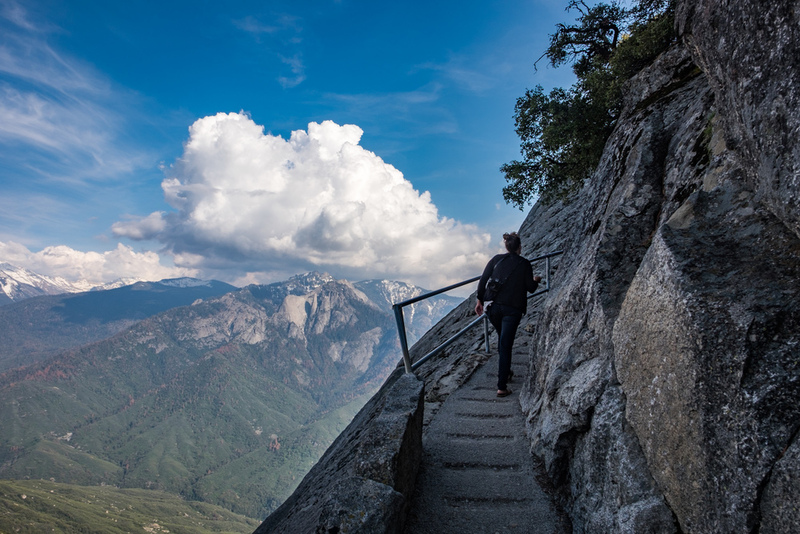 Weather can easily put a stop to your visit there (standing atop high cliffs during thunderstorms that commonly appear the area can be fatal), but on a clear day you can see the world. 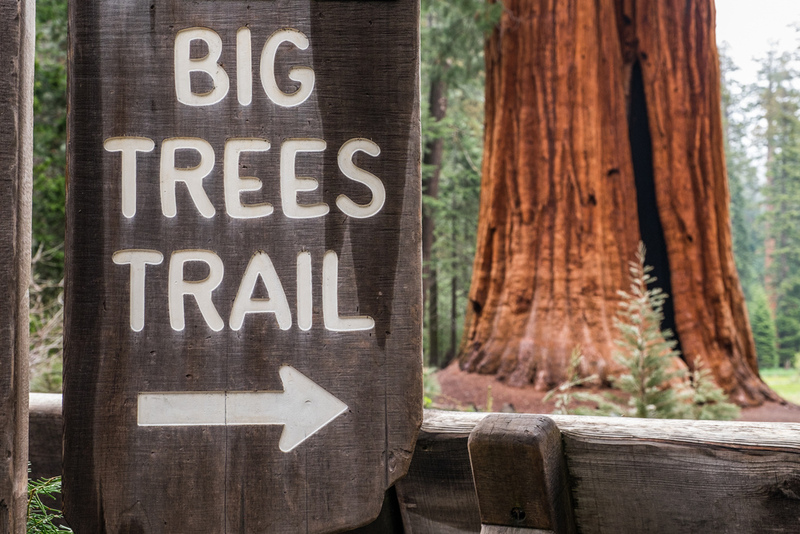 One of the best places to understand the ecology of Sequoia National Park is along the interpretive Big Trees Trail. 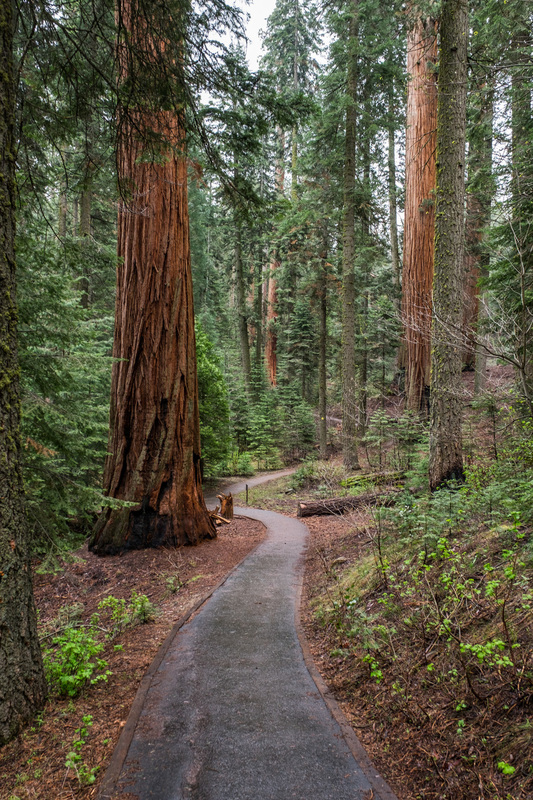 An easy walk along the Big Trees Trail will give any visitor a glimpse into the ecosystem of Sequoia National Park. 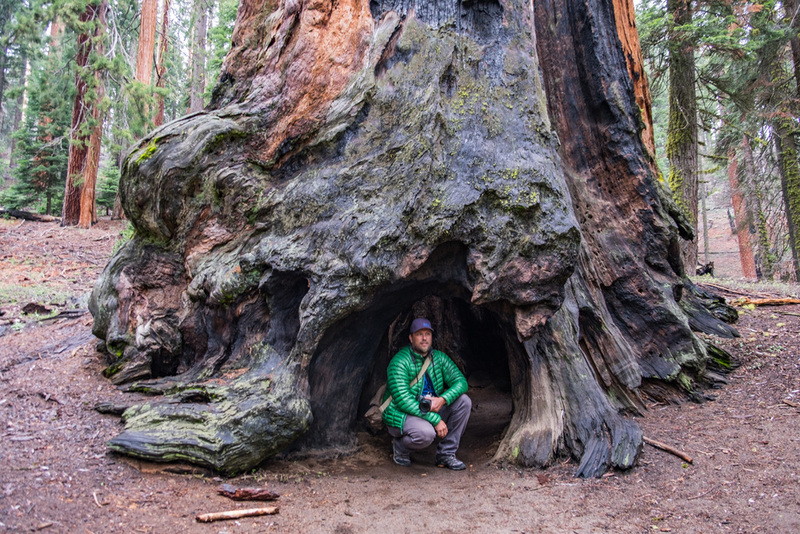 It is an easy 2/3-mile walk around a well-established loop trail that hugs the base of an ancient sequoia grove. 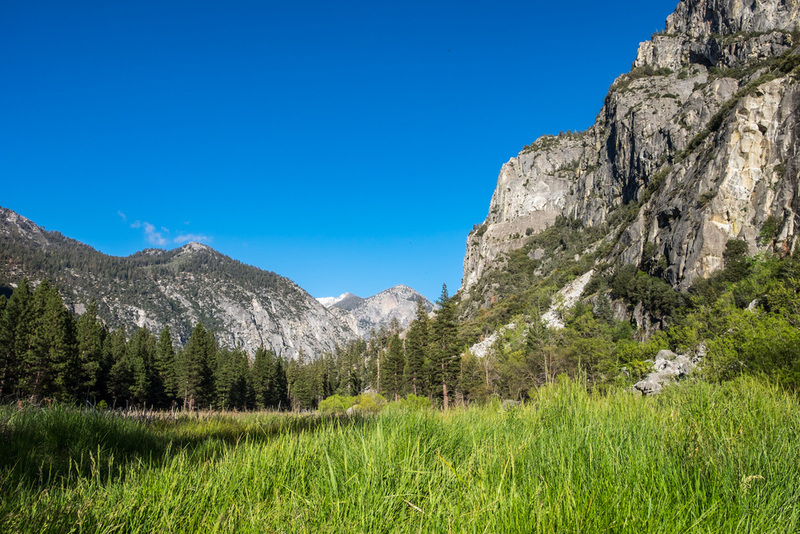 In the center is a lush meadow that is a perfect habitat for new sequoia growth. 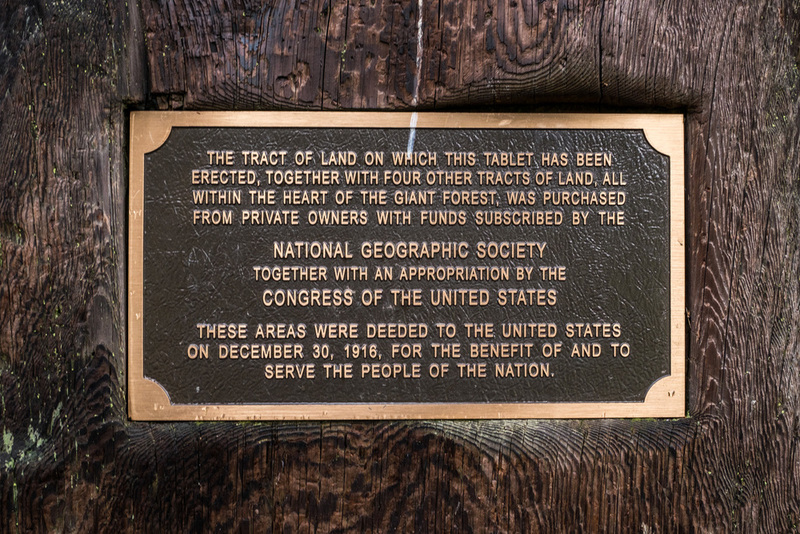 Educational signs along the interpretive trail explain the cause and effect of the area’s ecology and of the trees' survival. 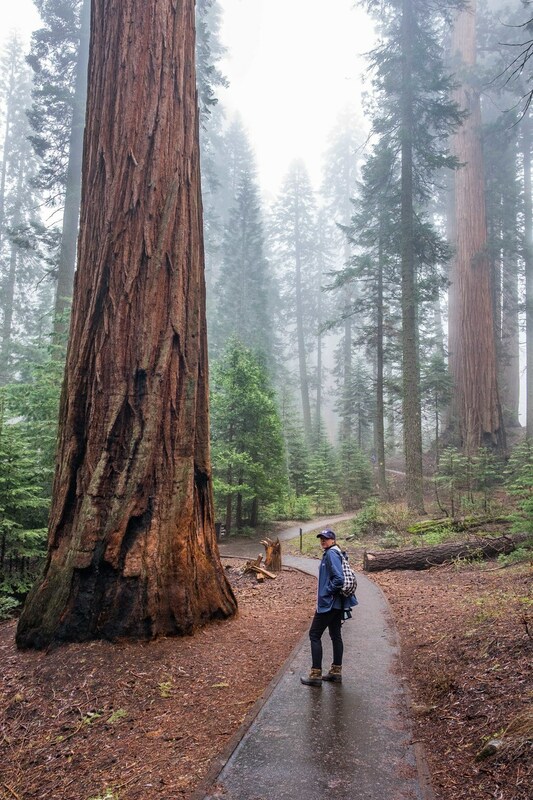 Our favorite aspect of this trail is that it allows a real understanding of the scale of these massive trees—it was here that Jonathan captured the photo that we are using as our featured photo of this park. 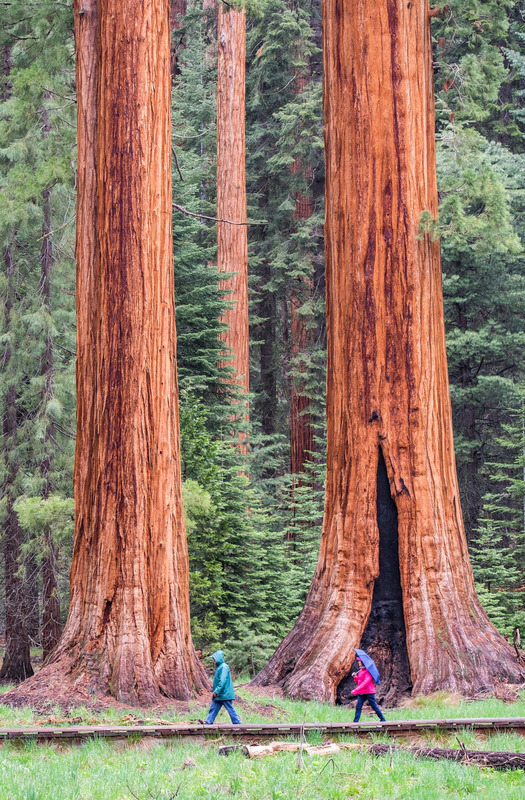 It is not easy to capture the size of a sequoia tree in a still frame, but we think that the most visually comprehensive photos of sequoias occur when there is a little bit of distance between them and the lens. 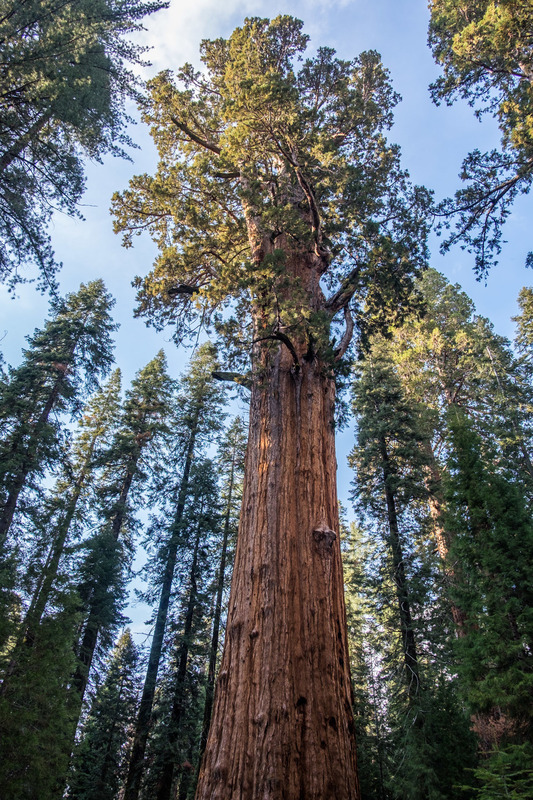 The world's largest tree by volume: General Sherman in Sequoia National Park. 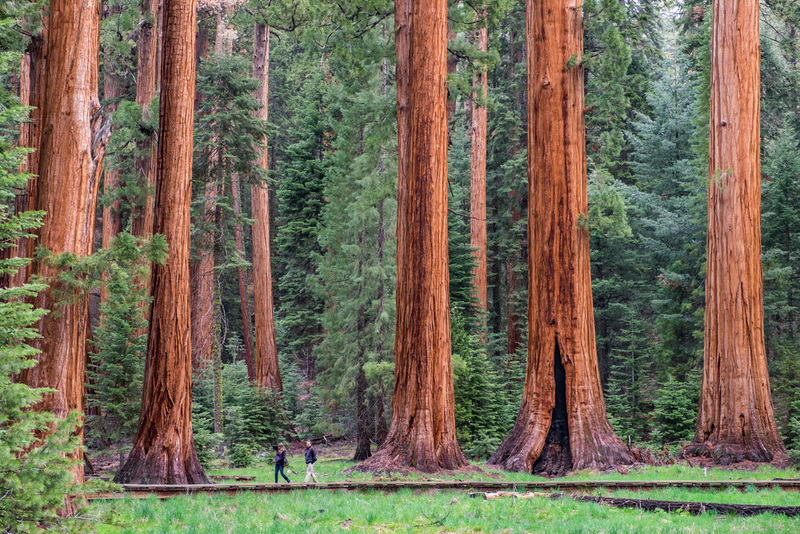 The world's largest tree by volume is the General Sherman Tree—the biggest draw in Sequoia National Park. It was there that we caught up with Good Morning America who came to feature us in a national parks special they were airing in May. They had requested that we wait to see General Sherman until we were on camera so that they could capture a raw and visceral reaction of our first viewing. While we were astonished that Good Morning America cared anything about us, we were flung back into reality by our first sight of the tree. It's impossible not to appreciate its size—so big that our project, the TV show, and everything else in modern reality faded in comparison to the 2,500-ish year old beast of a tree towering over us. 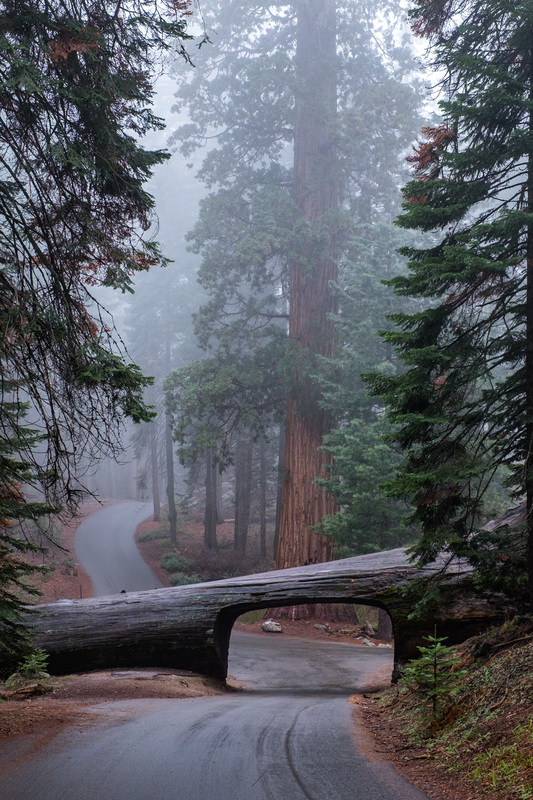 Tunnel Log on a misty day -- large enough to drive a car (but not an Airstream!) through. You want to drive through a tree, right? Who doesn’t. 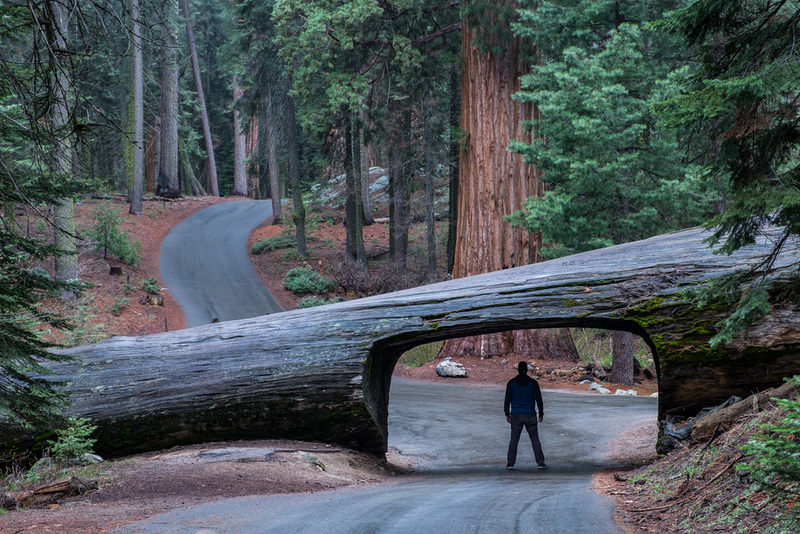 Tunnel Log is where you can have that experience and capture one of the most iconic views in the park: your car driving through a fallen and hollowed out sequoia tree. 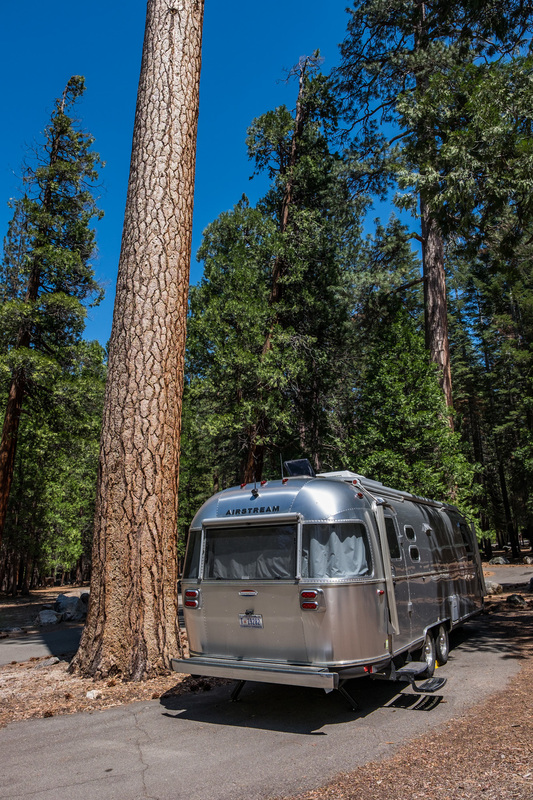 Lying across Crescent Meadow Road in the Giant Forest, the trunk is perfectly carved with enough space for a car (but not an Airstream) to drive right through. So creative! It was cut while still standing in 1881 and promoted as a tourist attraction. 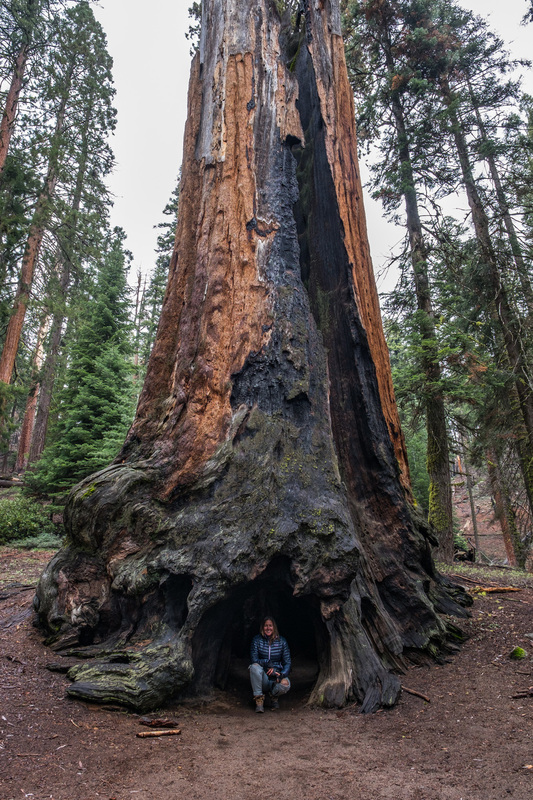 The 2,100 year old tree, named Wawona, fell during a storm 88 years later in 1969. And there it lays today, for all of us to go and see. Jonathan Irish stands tall on the trail in Crescent Meadow. 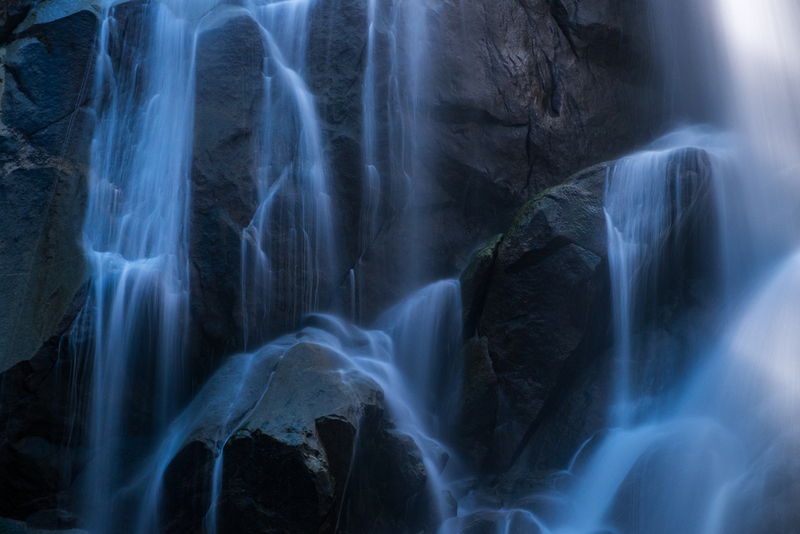 John Muir called this area "the gem of the Sierras." This area of the park is very beautiful. 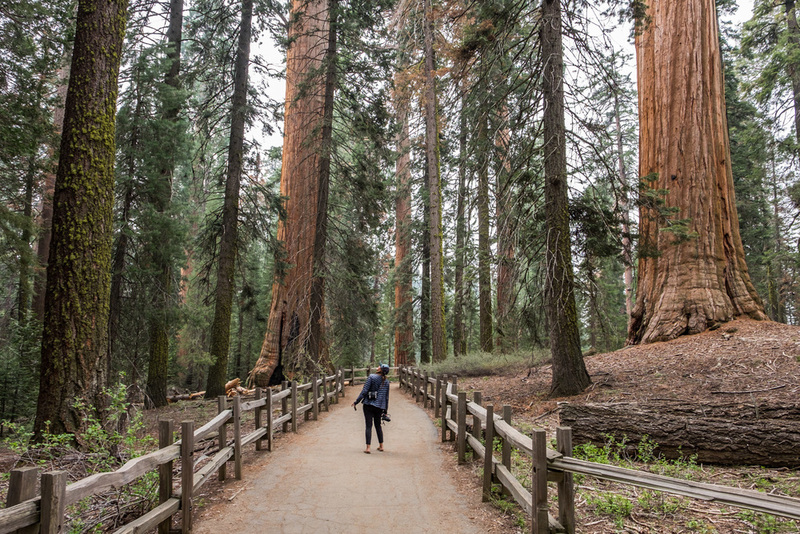 It is a perfect place to wander through giant sequoia groves, and with several offshoot trails, you can plan and make changes to your route as you go. 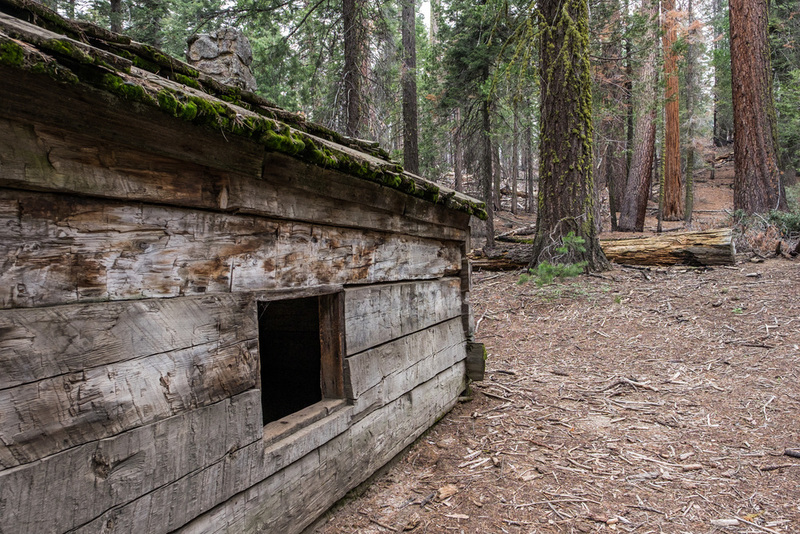 We were attracted to Crescent Meadow for the same reasons that many others are... it is said to be one of the best places in Sequoia to see wildlife, including black bears. And we really wanted to see a bear. In Log Meadow, adjacent to Crescent Meadow and just a short hike away, we spotted a large, female, cinnamon-colored black bear grazing in the middle of the field. 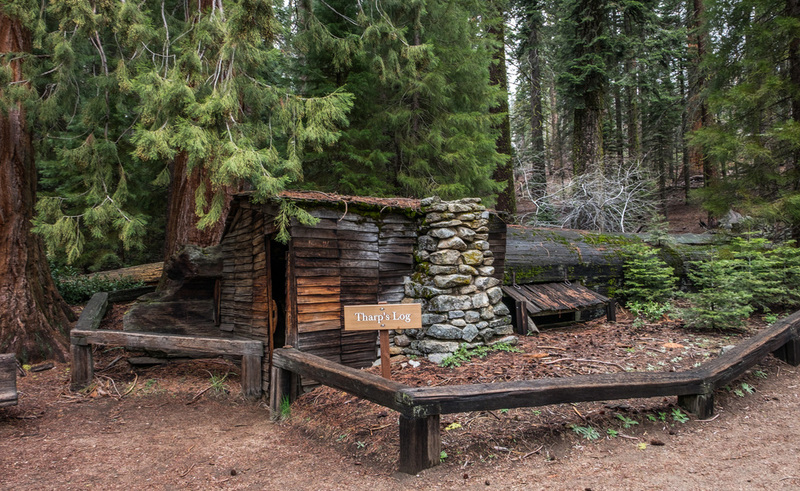 Log Meadow is also the location of "Tharp's Log," a hollowed out tree that was made into a home by Hale Tharp—the first non-Native American to inhabit the forest. 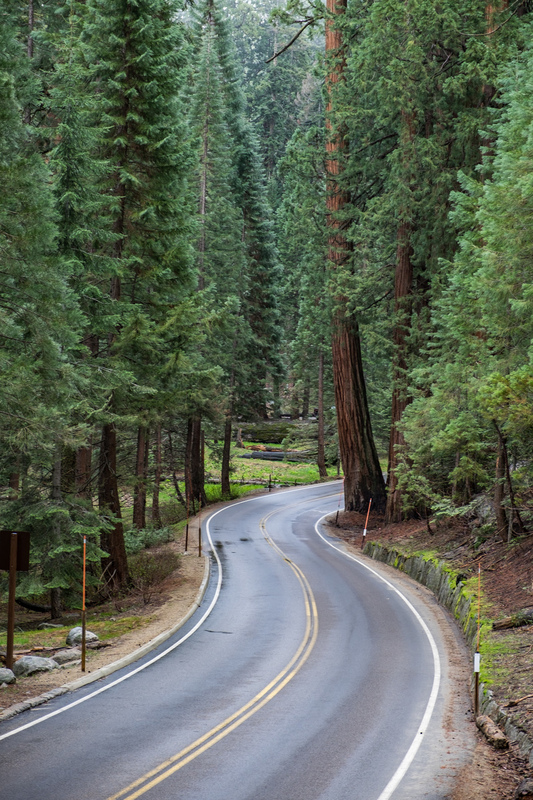 If you love winding mountain roads, both Sequoia and Kings Canyon are parks to add to your roster. 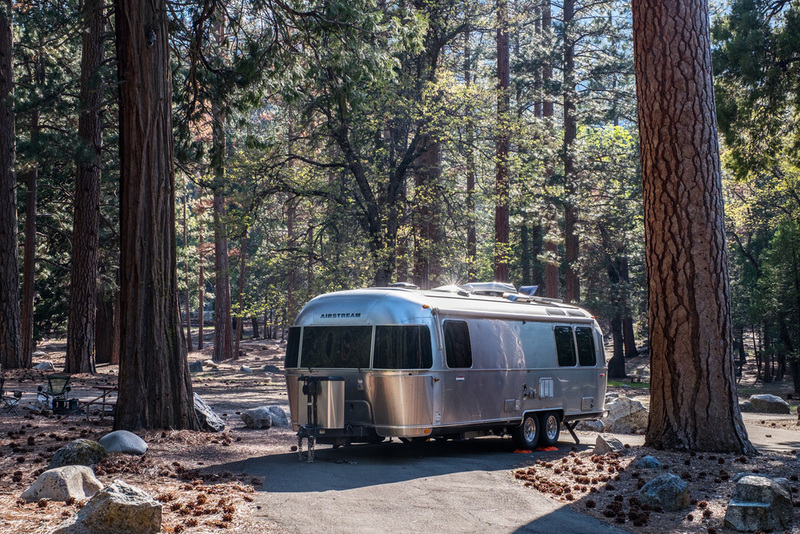 Our home-base for quick access to Sequoia National Park was in the town of Three Rivers, located just seven miles from the park entrance. From there we were able to easily stop at the iconic entrance sign and park visitor center before starting our trek by car into the clouds. 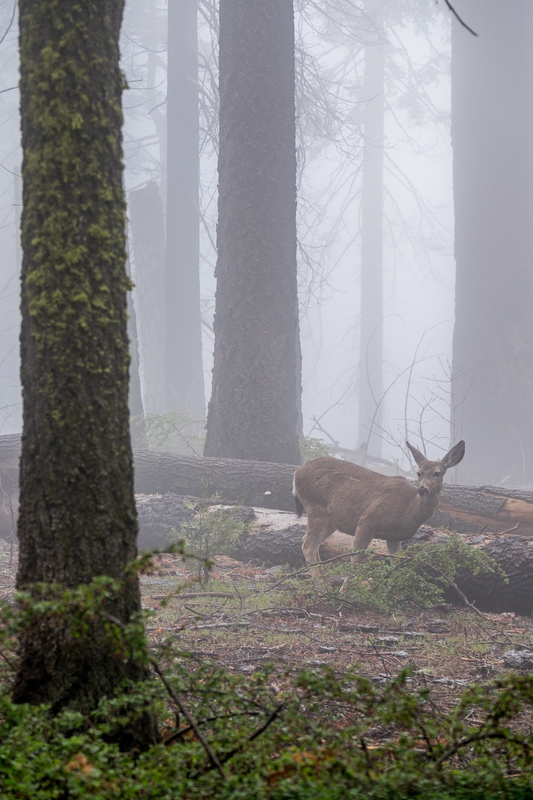 The road shots personify the soul of our adventure this year and the dense surrounding forest adds a bit of unpredictability to the route—wildlife, weather, and incredible landscapes can show themselves at any time. It is the same things that make the drive up so exciting that make the drive back a little bit grating—an hour of constant twists and turns while riding your break the entire time along with the prospect of wildlife darting in front of your vehicle make low gears and cautious driving your BFF's on highway 198. 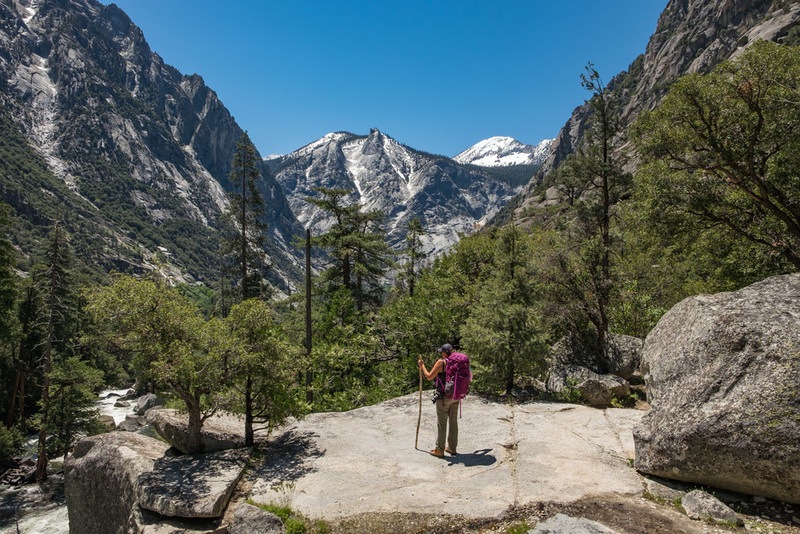 John Muir called what is now Kings Canyon National Park "A rival to Yosemite." 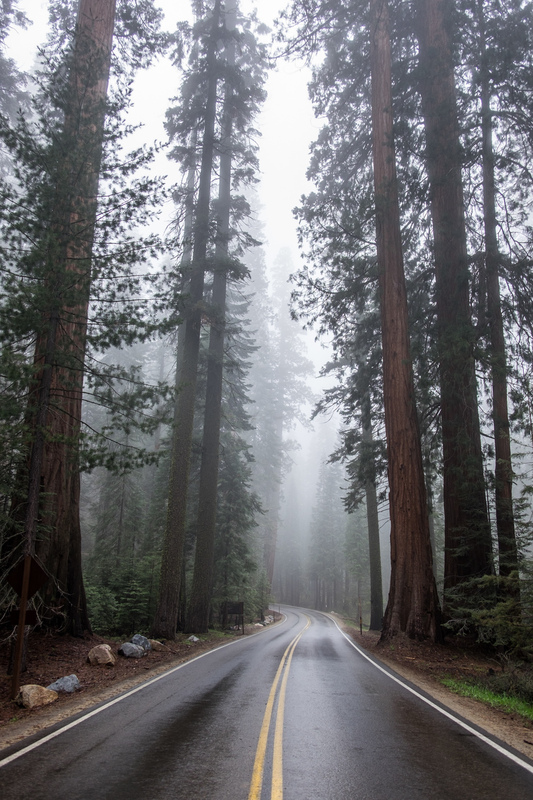 Our drive into Kings Canyon has remained one of the highlights of our journey this year. 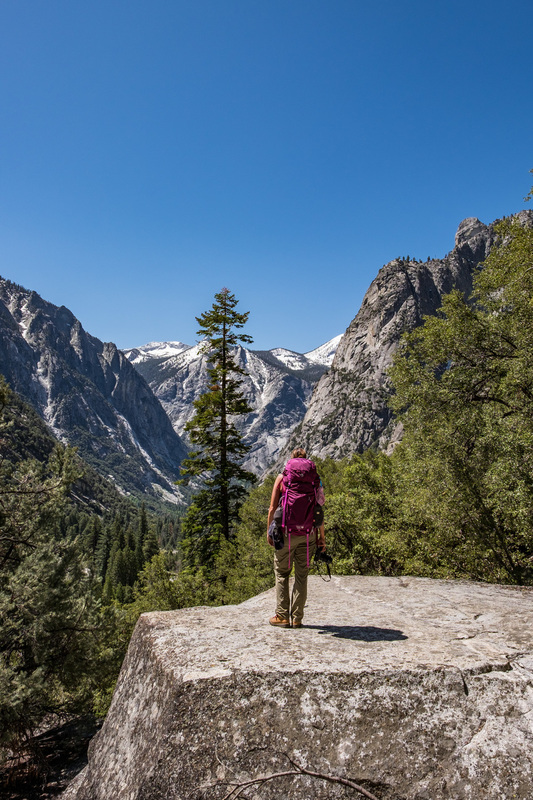 Kings Canyon National Park is broken into two sections—the area closest to Sequoia National Park and where you can find the world’s second largest tree, General Grant; and the canyon where at the base of lives the Kings River. 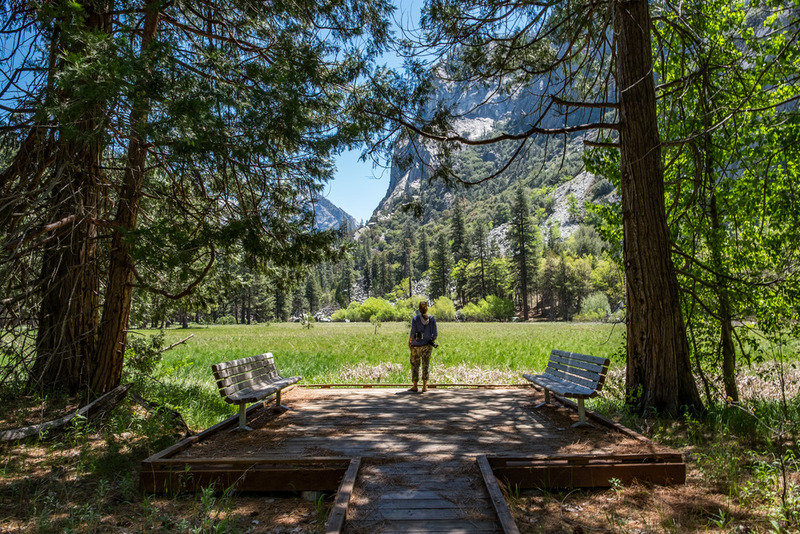 This drive is where you will have your ‘aahhh-WOW’ moment in the park leading to the area that Muir and Adams campaigned for protection for so long ago. Driving over the pass you will crawl the mountainside into a valley that, as I mentioned in the intro, John Muir once said rivaled the Yosemite Valley in terms of beauty. They are incredibly reminiscent of one another, so much so that while looking at a picture of Kings Canyon the other day, I thought it was Yosemite. 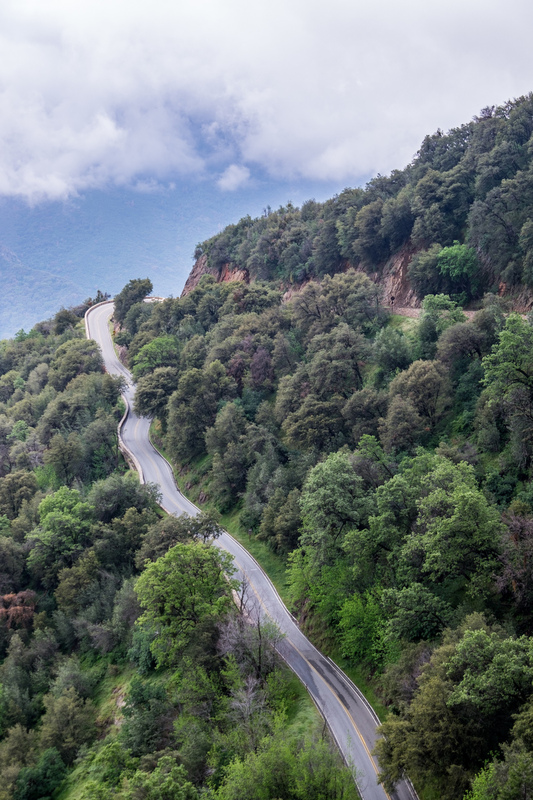 The Kings Canyon Scenic Byway provides 50 miles of road-traveling-bliss to Roads End ... and along the way you can scout your next steps while in Kings Canyon. 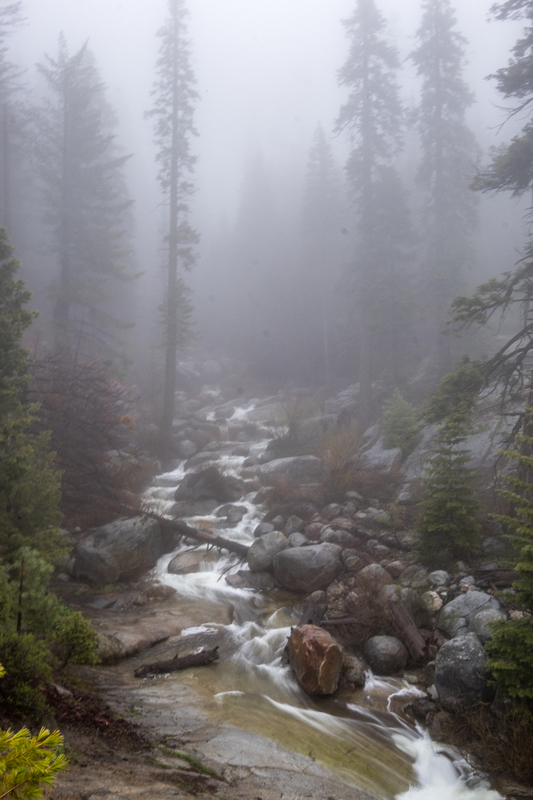 The trail to Paradise Valley brings hikers to one insanely beautiful viewpoint after the next. 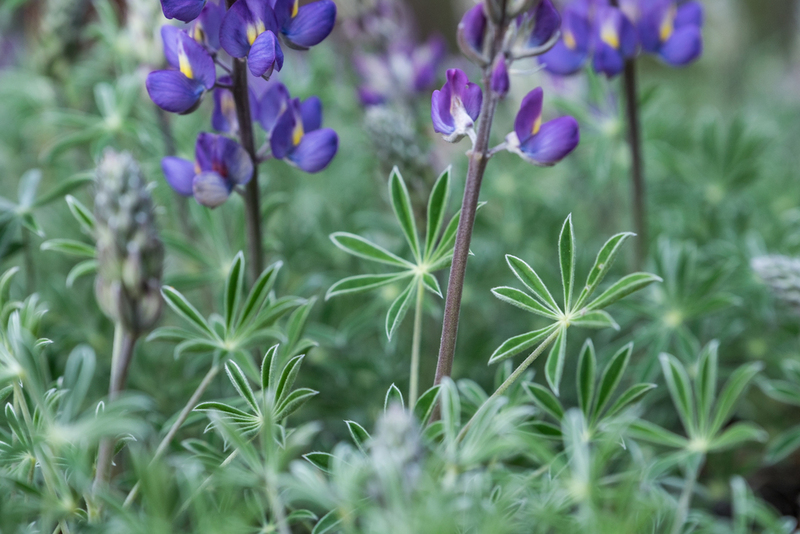 It was during our backpacking adventure to Paradise Valley that we were reminded once again on this project that we were venturing, as guests, into a thriving wildlife habitat. It was on the John Muir section of the trail that we had our first meeting with rattlesnake this year, who quickly let us know that we were on his turf with one loud shake of his rattle. From just a couple feet away we watched it scoot far enough ahead that we felt we could safely bypass the area. From what we heard from other hikers, there were many rattlers out that day and according to the trailhead alert board, for many days prior. Next came our first close bear encounter – he was a juvenile and after realizing that we weren’t threatening, he continued about his business allowing us to watch his behavior from a safe distance. If you are into wildlife, this is an amazing place. If you are scared of wildlife encounters, this is still an amazing place—just be sure to learn their behaviors and how to tailor your own in such situations and you’ll be fine…and amazed. Wildlife sightings are the most exciting part of our adventure! This great American road trip is turning out to be a great American safari as well. 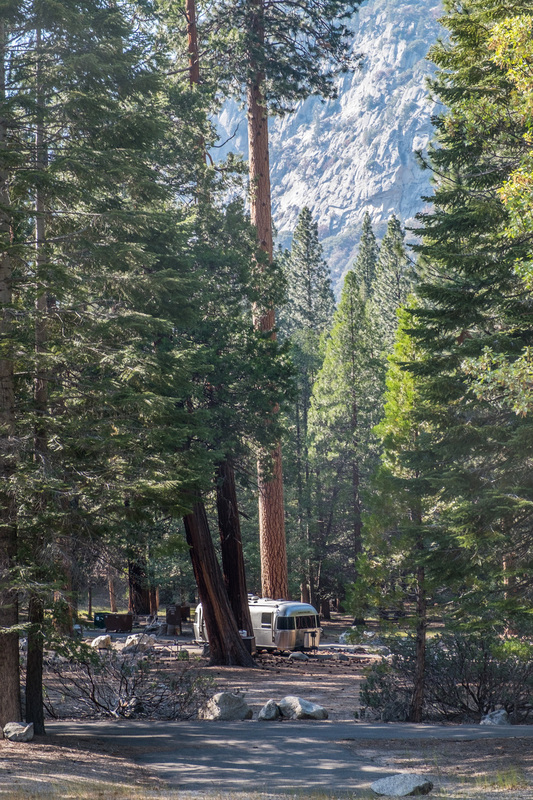 One of the best camping spots we've found all year in the national parks -- Sentinel Campground in Kings Canyon. Free firewood, and space for days!! 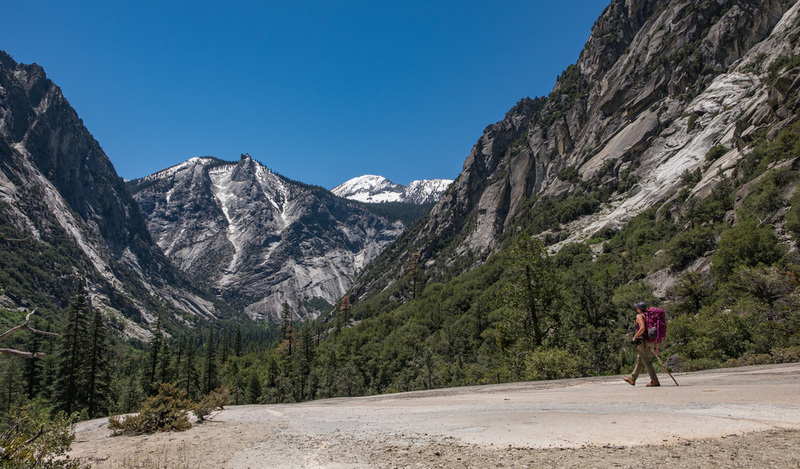 Our jumping off point into Kings Canyon was at the NPS Sentinel Campground and it has been our favorite campground to date. 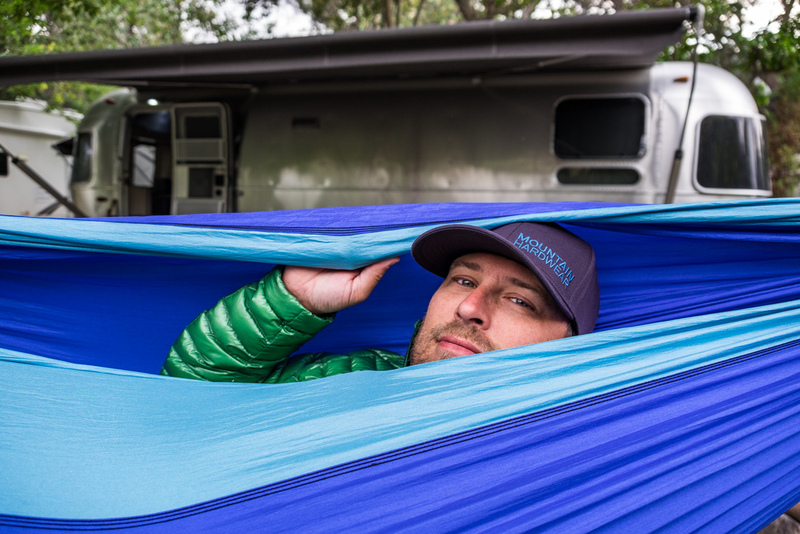 The sites sit within an expanse of space that allow viewing of the surrounding area but it still feels enclosed, provides more than enough room for Wally to enjoy a good boondock, and with so many tree branches falling to the ground, firewood is for free of the taking! 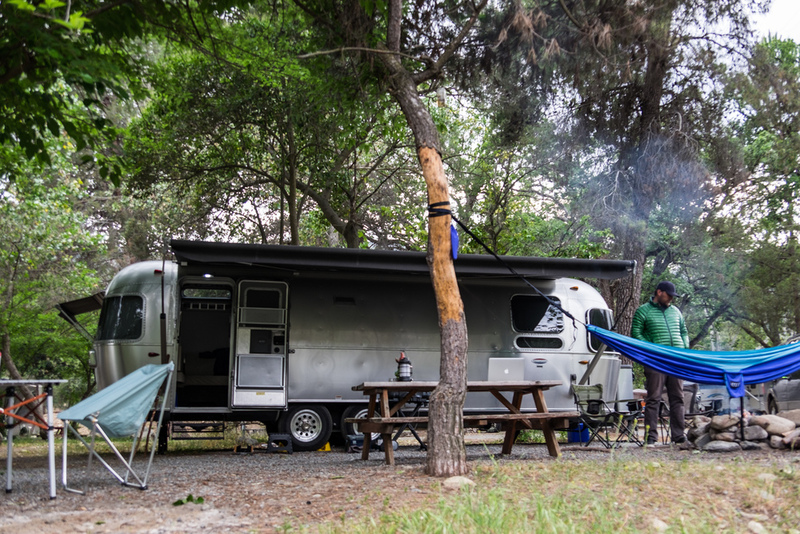 There is a concessioner-ran camp store located just down the street from the campsite and the location is situated within close proximity of trails and falls in the area. The only grievance is that it was here that Stef's precious hiking boots were lifted. Boo. :( Recommendation: safe keep your boots! 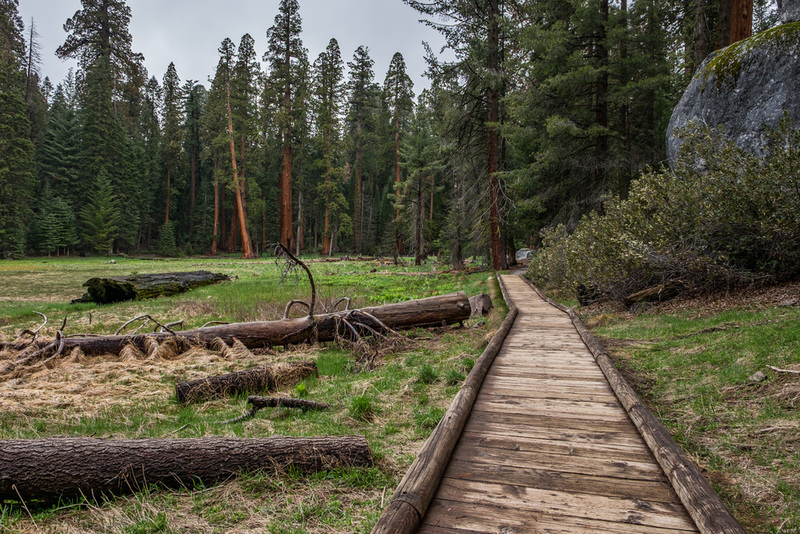 The boardwalk on the valley floor at Zumwalt Meadow. 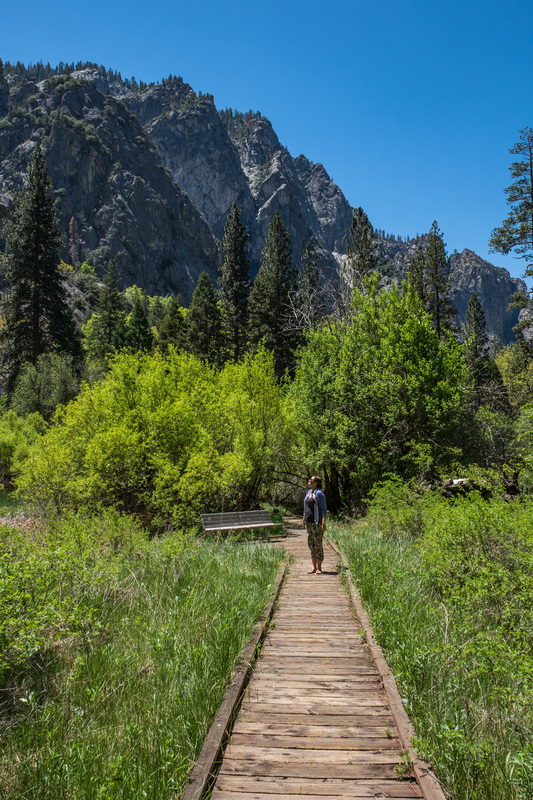 It is said that his 1.5-mile trail provides the most comprehensive scenic look at the Kings Canyon meadow floor and we would be inclined to agree with that claim from what we saw there. 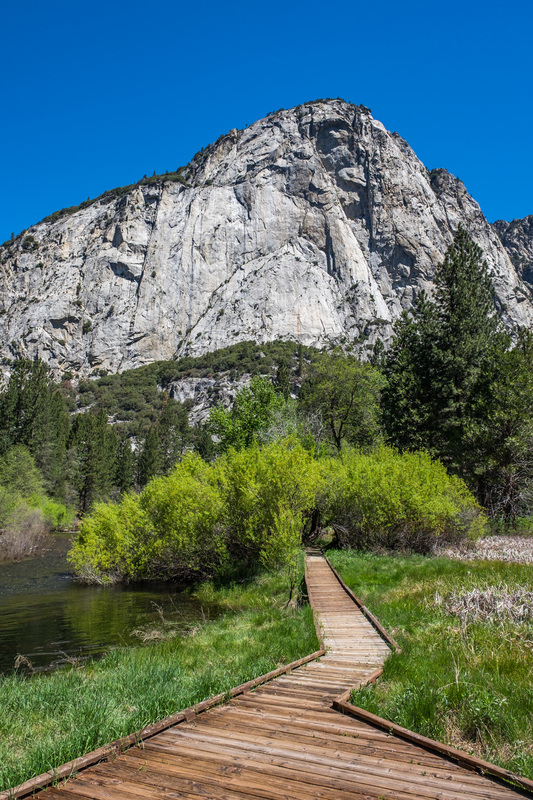 With boardwalk walking trails stretching the perimeter of the valley and granite stone cliffs towering overhead, the landscape views stretch far, high, and wide. It’s one of those places that is so very peaceful that you almost cannot comprehend it ... every five minutes we just kept uttering "it is so peaceful!" And when you find yourself in the still of your own quieted mind and physical environment is when wildlife tends to show herself most. Hushes all around here and that made it a very memorable experience. 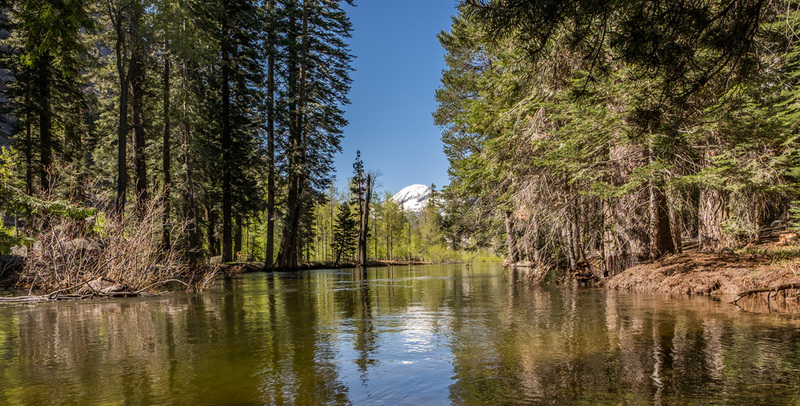 Both parks are UNESCO International Biosphere Reserves; home to the world's largest trees and to the highest peak in the lower 48 states. 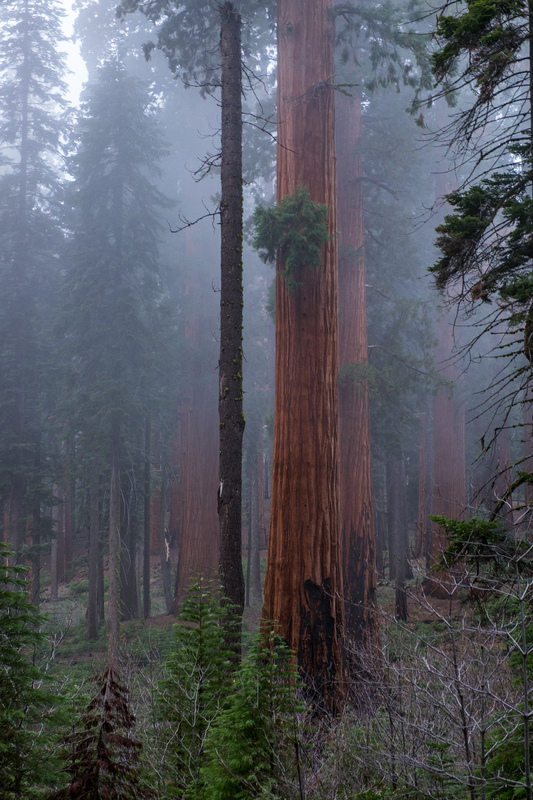 Sequoia National Park: This park was named after the giant Sequoia tree! 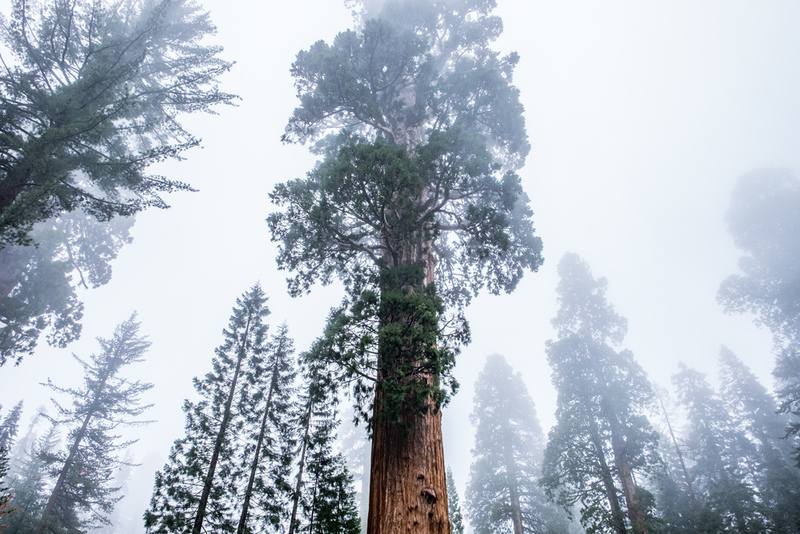 The naming of the sequoia tree has a complicated past—some stories say that it commemorates a Cherokee Indian Chief named Sequoya, who is well known for giving a phonetic alphabet to his nation; others record that it was named after the tree genus of its close relative—the redwood tree—which was named after the Latin word sequoiadendron giganteum ... We'll leave this one to the scholars and historians. 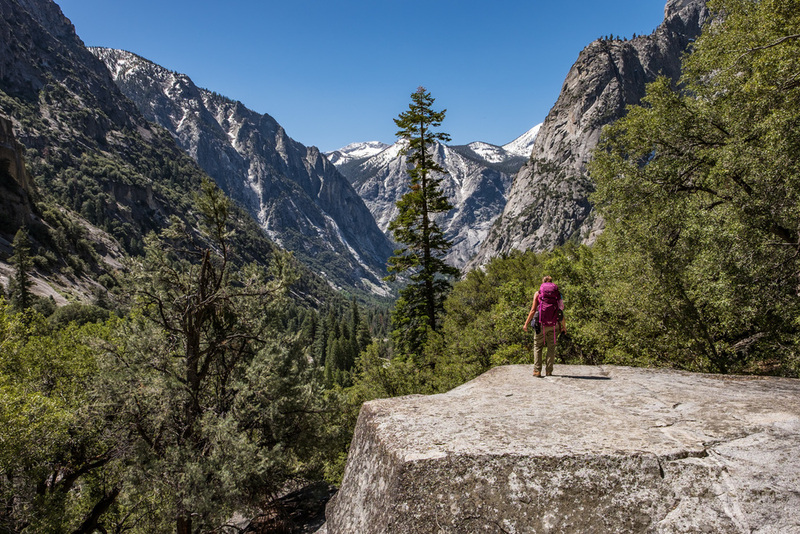 Kings Canyon National Park: Kings Canyon is one of the deepest canyons in America—1.5 miles deep—and was named for the Kings River that flows through the base of it creating the canyon. 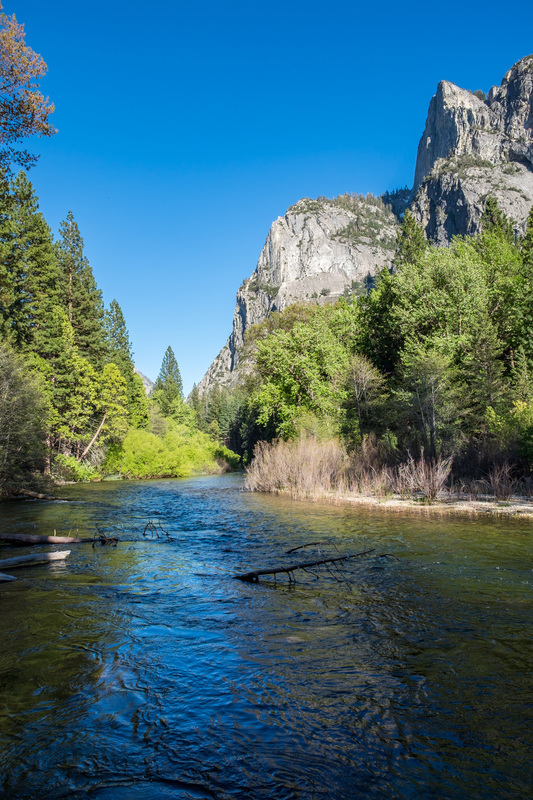 The Kings River also flows through Sequoia and Sierra National Forests. The iconic National Park Service 'Arrowhead' logo shows a sequoia tree and bison, representing vegetation and wildlife; mountains and water represent scenic and recreational values, and the arrowhead shape represents history and archeology. 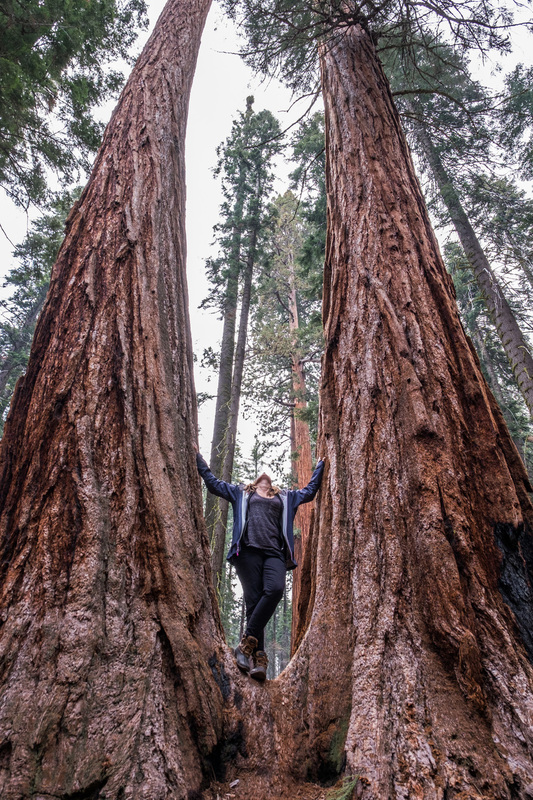 Sequoia National Park: Hands down this honor goes to the General Sherman Tree—the largest tree in the world by volume—so iconic that it was chosen by the National Park Service to represent all trees in all of the parks on the iconic Arrowhead logo insignia (pictured right.) 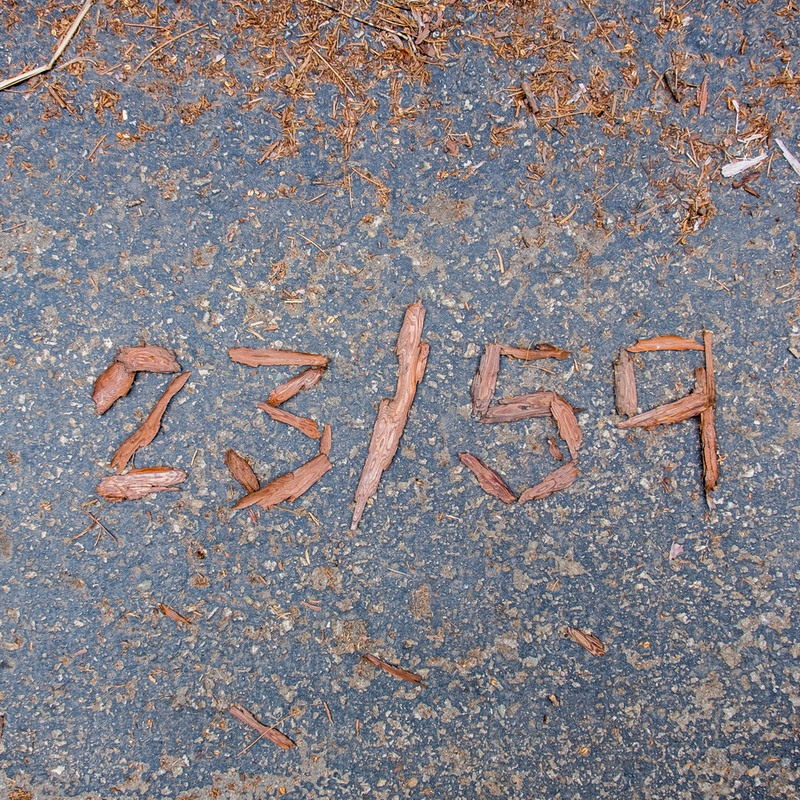 It is estimated that General Sherman is between 2,300 and 2,700 years old. 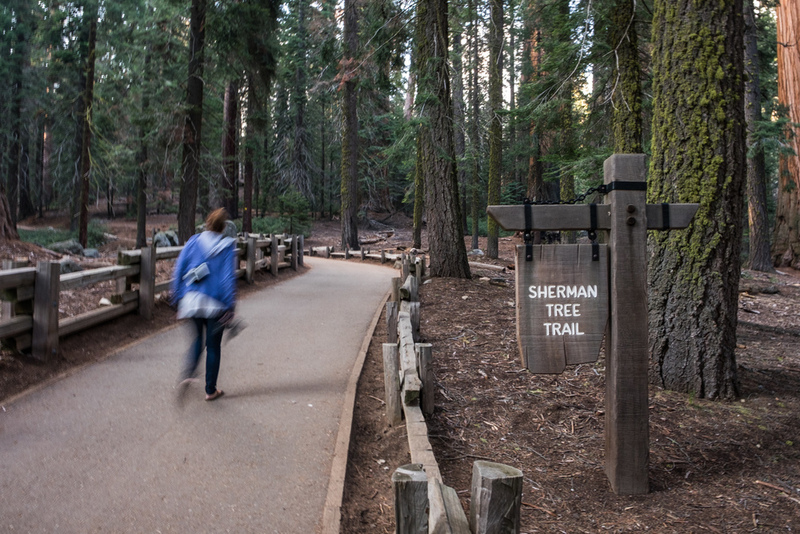 A new, well-established trail to the iconic site was completed in 2006, allowing more space for visitors to wander and to better appreciate the massive size of the tree. 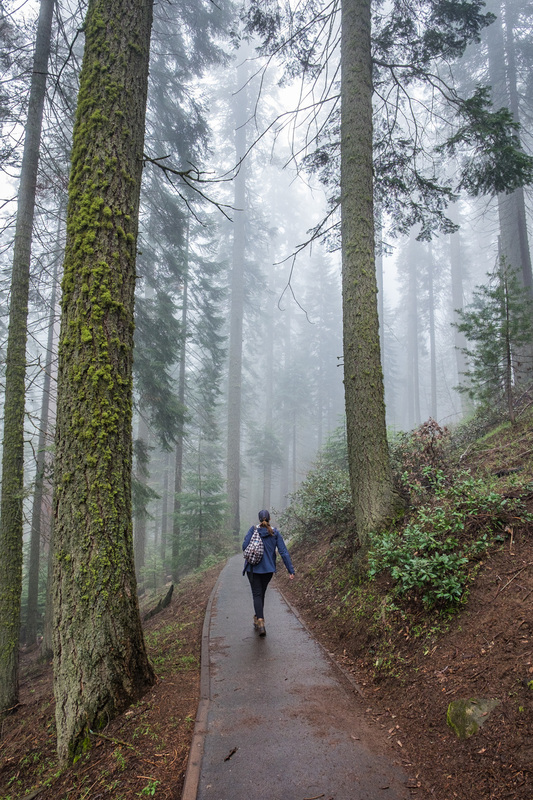 The 0.8-mile out and back hike is a breeze, but do go slow—the elevation at the parking lot is 7,000 feet, and you most likely climbed by car to get there so you might be a bit light headed on the short walk due to the elevation change. 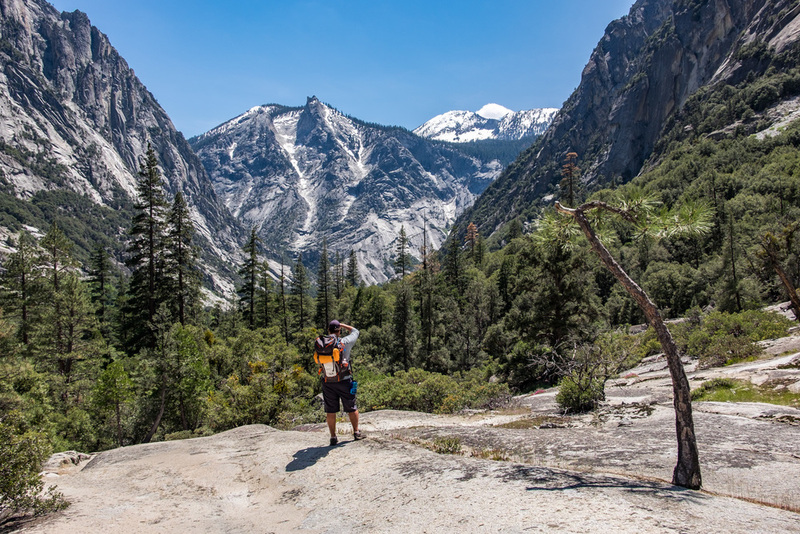 Kings Canyon National Park: The views on the Kings Canyon Scenic Byway took our breath away. 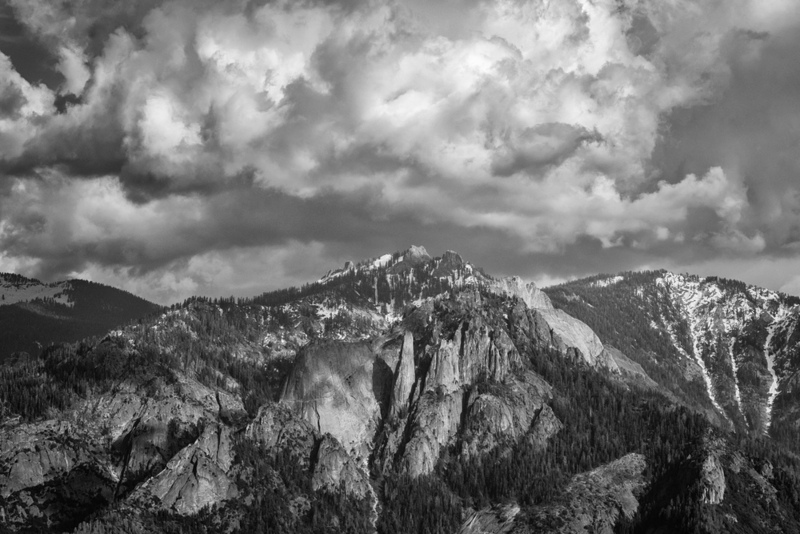 It is these views that Sierra Club photographer Ansel Adams captured and shared with the U.S. government to successfully lobby for national park status. 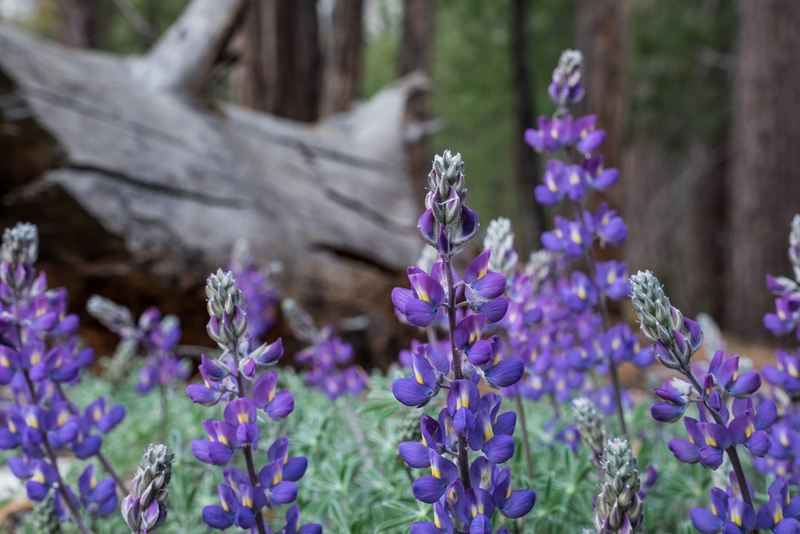 Winding down the 50-mile mountain pass you will see wildflowers, forests of trees, sloped mountains, rock formations, and at the base of it all, the Kings River—the stepping off point to the wilds of the Sierra Nevada wilderness. 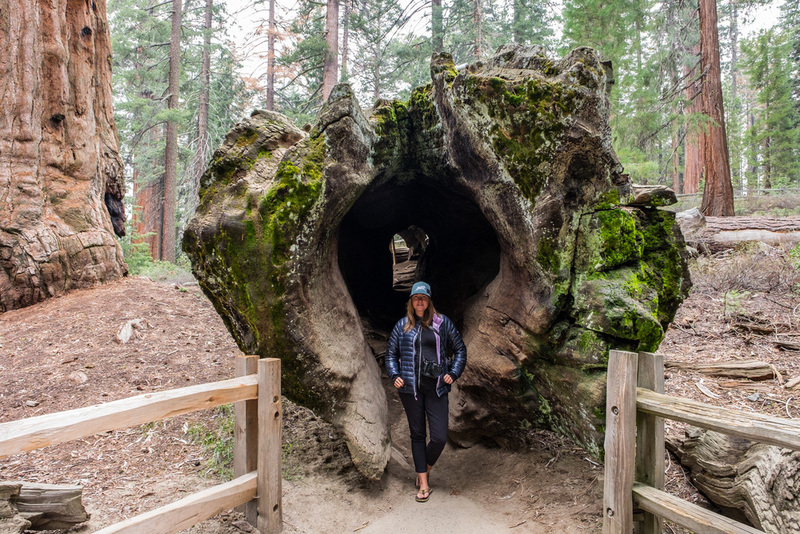 Sequoia National Park: The Big Trees Trail is a one-mile loop trail through an ancient Sequoia grove where you National Park Service signage will teach you about the ecosystem that makes up the Sequoia National Wilderness and the center of its universe, Sequoia National Park. 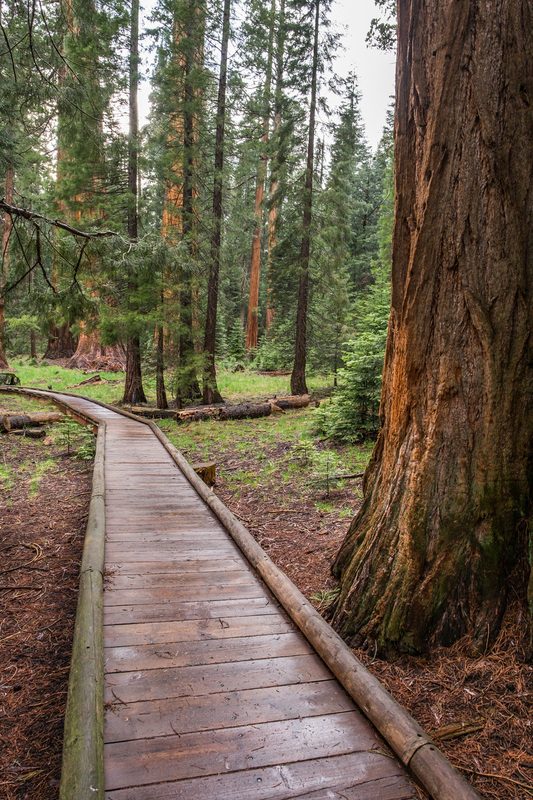 This trail is unique in the park because a meadow settles in its center, allowing some distance to view the trees and gather a sense of their scale, particularly with hikers trekking beneath it. It is set next to a parking lot, is wheelchair accessible, and provides a great place for children of all ages to explore and play. 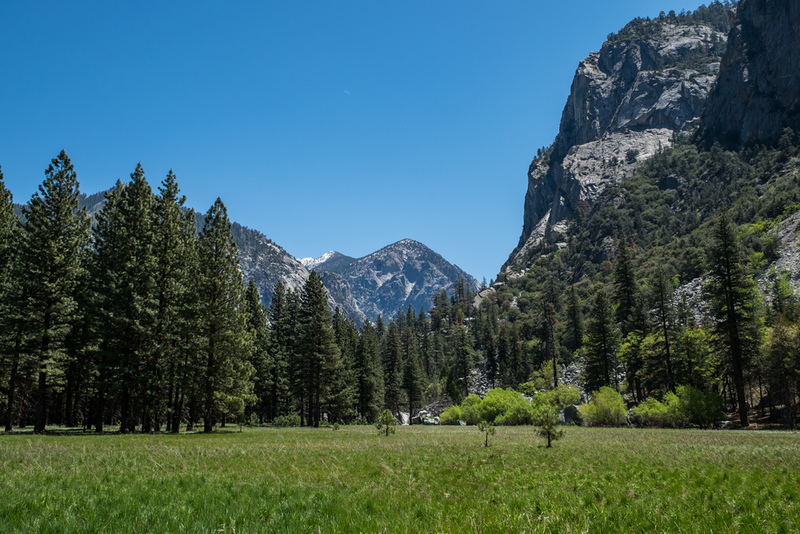 Kings Canyon National Park: It's difficult to describe in words how peaceful Zumwalt Meadow really is. Birds sing all around, the Kings River rushes beside you, the breeze is gentle, and the sun dances through the entire setting. 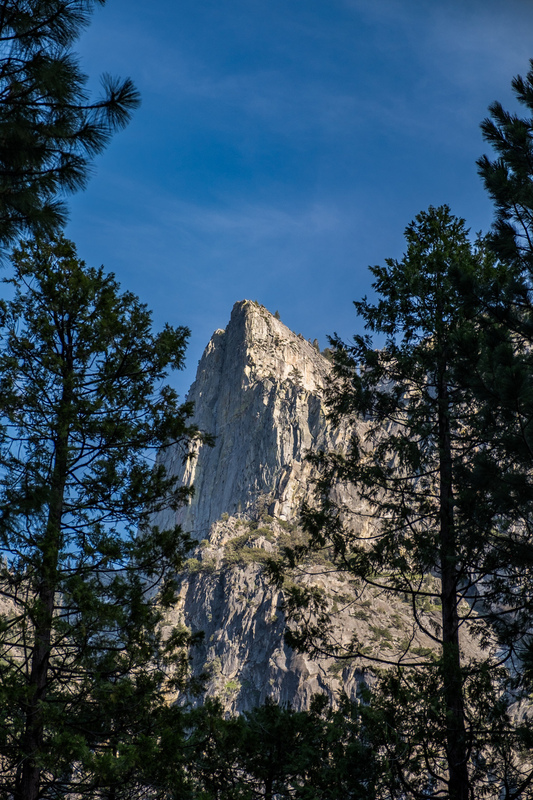 Towering above are dramatic canyon walls ... a very peaceful place to wander in, search for wildlife, and to photograph. Most of the 1.5-mile walk is accessible to those on wheels, and the parts that aren't are relatively easy to traverse. 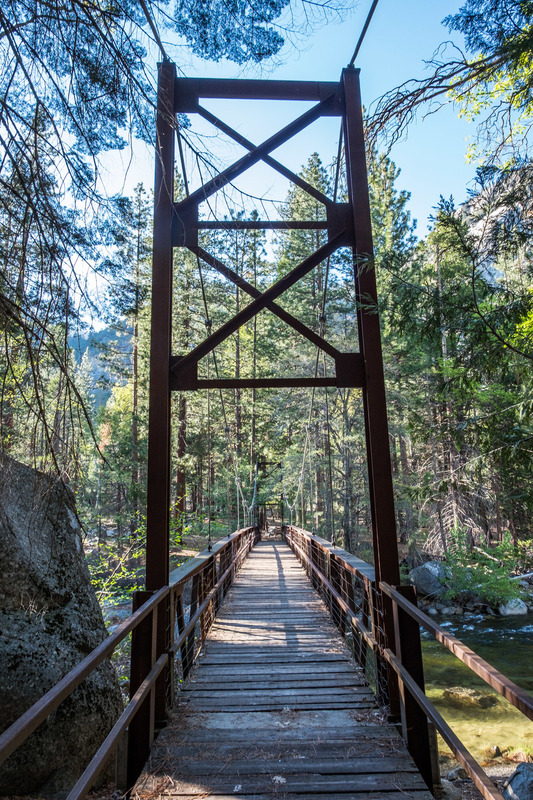 The boardwalks bring you through sceneries that really personify Kings Canyon—one of the most lovely parks we've visited so far this year! 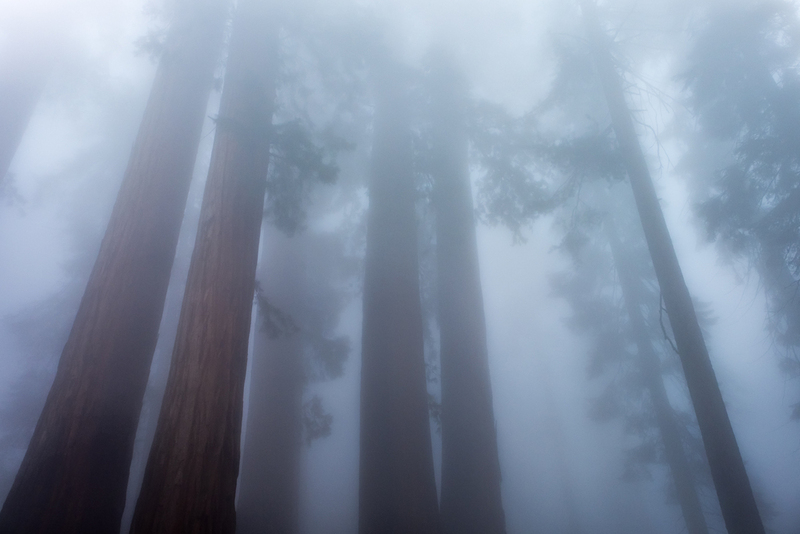 Sequoia National Park: Climbing Mt. Whitney! 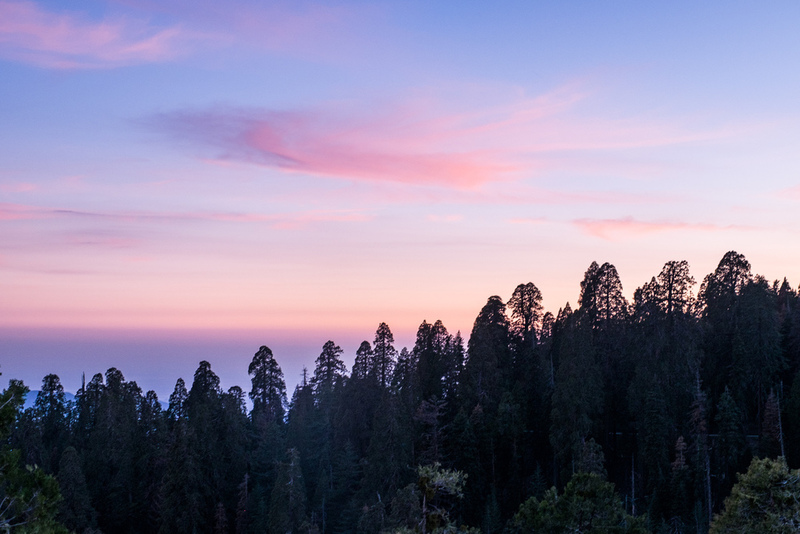 The highest peak in the lower 48 states stands in the east part of Sequoia National Park and it is one of the most climbed peaks in America if not the world. 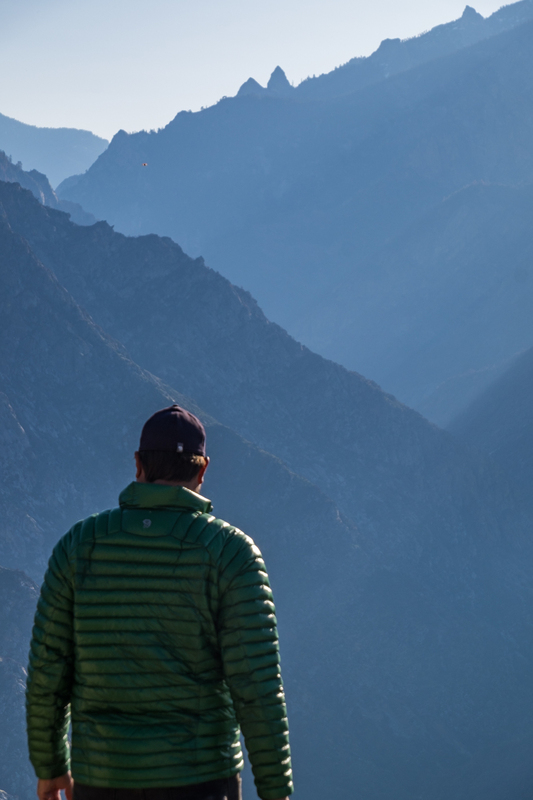 Every year it welcomes "highpointers" (those wishing to climb all of the highest peaks in the United States), and others from around the world wishing to get sky-high in the high Sierras. Technical climbing gear isn't necessary from July to September, and before that, ice axes and crampons will help visitors make their way. Permits are required, and they go fast so plan ahead. This trek is best enjoyed as a 2-3 day backpacking excursion. As always with our Big Adventure recommendations, a stop at the NPS visitor center in advance is a must. 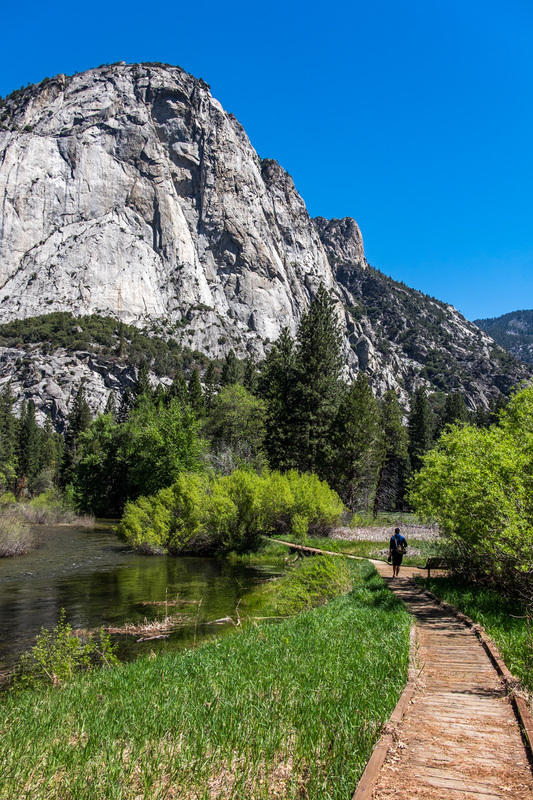 Kings Canyon National Park: The Rae Lakes Loop Trail is one of the most popular hikes in all of the high Sierras, one of the most coveted mountain ranges on Earth to explore. 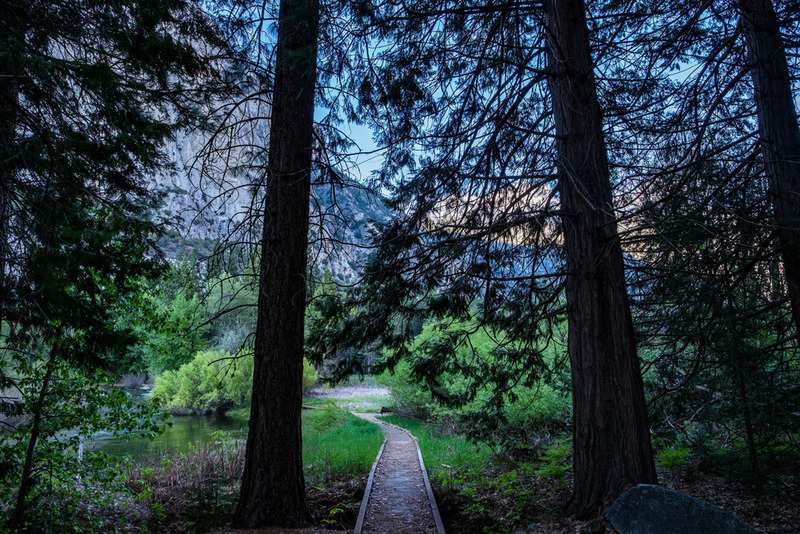 Rae Lakes follows 41 miles of the 215-mile John Muir Trail, making an elevation gain of more than 5,000 feet. 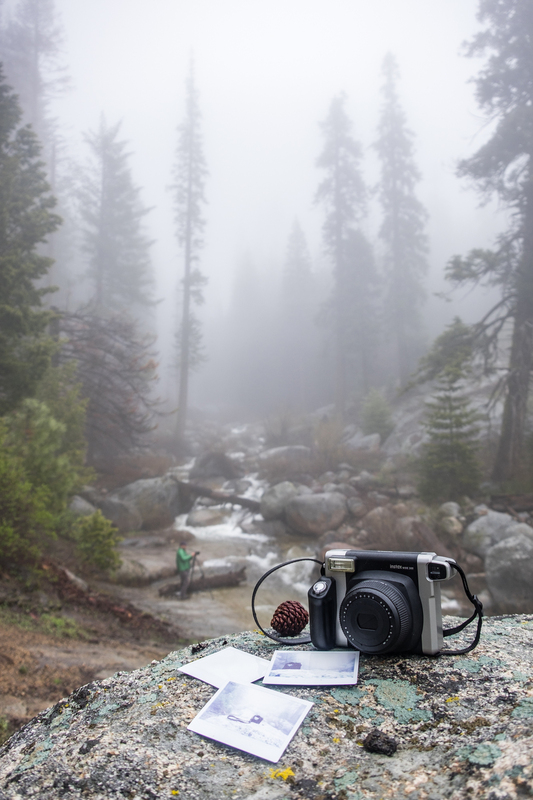 Along the way, hikers experience amazing views of reflective lakes, towering snowcapped mountains, rushing waterfalls, fields of wildflowers, boundless wildlife, and the word is that it is one of the most photogenic areas in all of the Sierra Nevada mountain range. By the time we realized that we were determined to experience this trail, we also realized that we didn't have four days to spare. And so it goes, this adventure is secured on the "must-return-to" list that we are making for the future. Every U.S. National Park has displays honoring their incredible history. This plaque of Stephen Mather, the first Director of the National Park Service, can be found in every park. 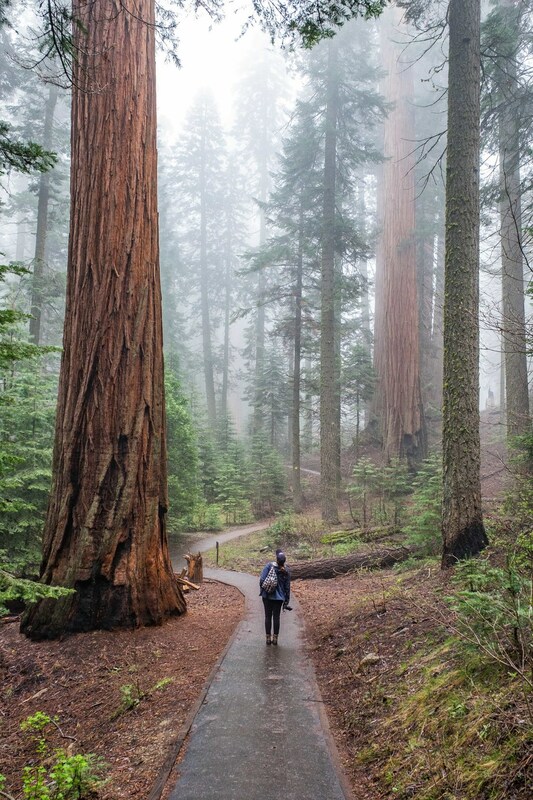 Sequoia is America’s second national park. 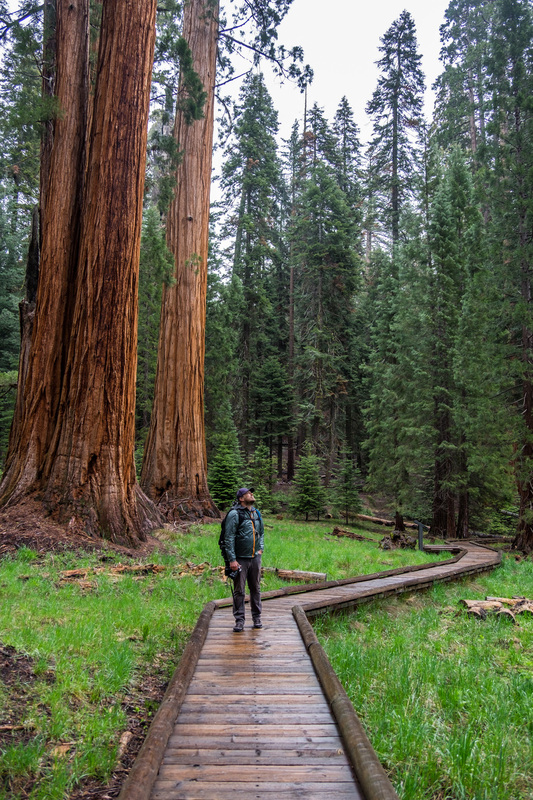 It was the first national park to be created to protect a living organism, the giant sequoia tree, which at a time of the park formation was vulnerable to complete destruction due to logging endeavors. 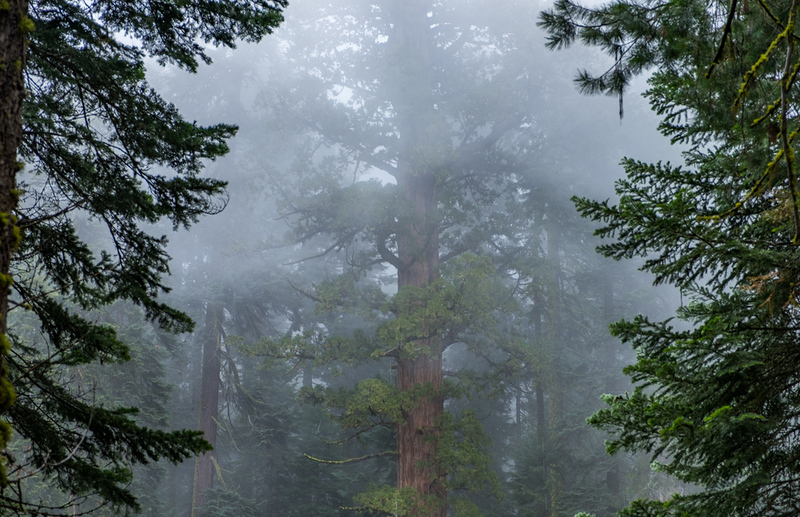 The largest tree in the world by volume is in Sequoia National Park, it's name is General Sherman. 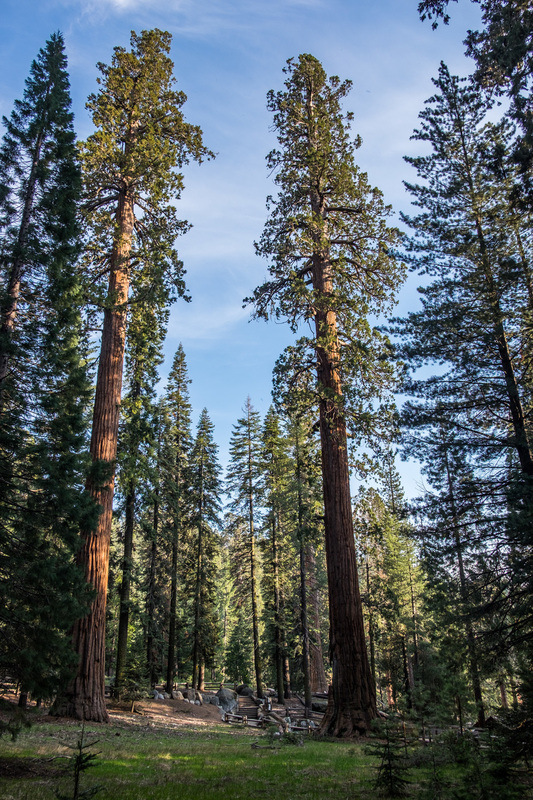 The largest of the sequoias are as tall (on average) as a 26-story building. 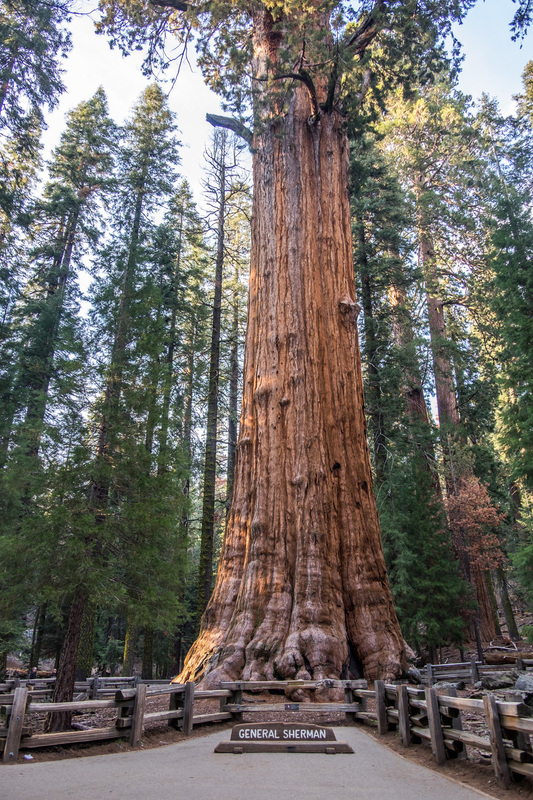 The world’s second largest tree by volume, the General Grant Tree, can be found in Kings Canyon National Park. It is not only America’s official Christmas tree, but also a national shrine dedicated to U.S. veterans in 1956. 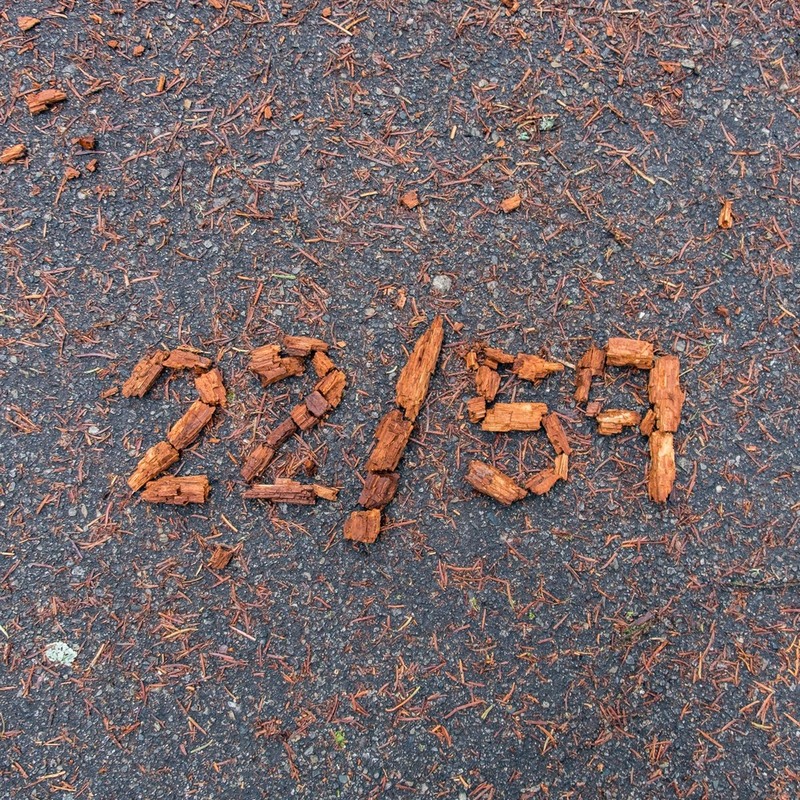 It is estimated to be 2,000 years old. 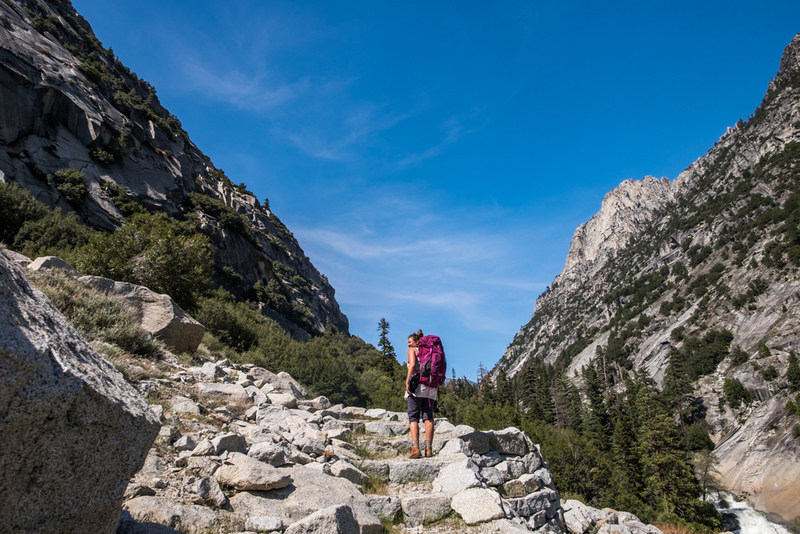 The Pacific Crest Trail isn't the only epic hiking trail weaving through western America—the 215-mile John Muir Trail starts in the Sierra Nevada mountain range in eastern California and winds through Kings Canyon National Park, Sequoia National Park and ends in Yosemite National Park. A black bear grazes in Log Meadow. 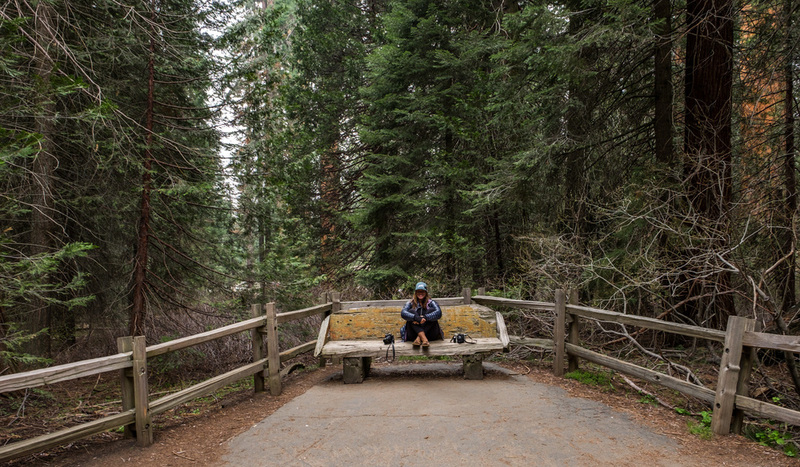 Looking for solitude? 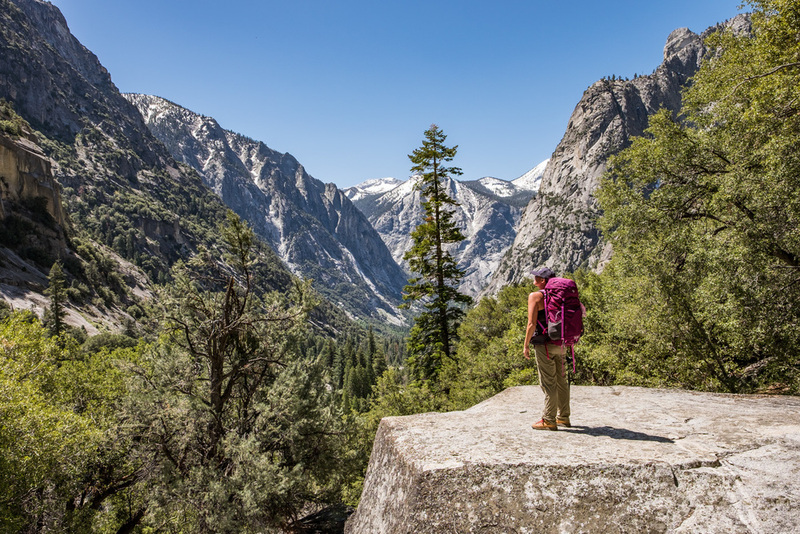 National Geographic wrote that while backpacking in Kings Canyon, you can travel farther from any road than anywhere else in the lower 48 states. 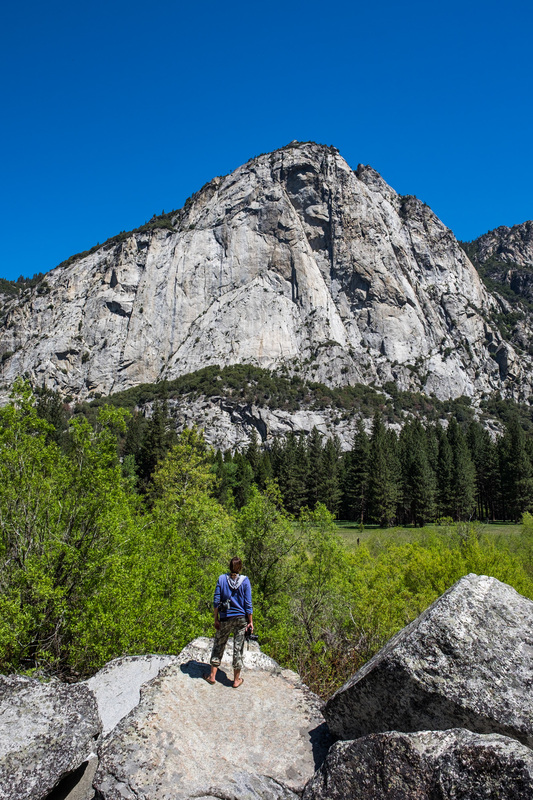 Kings Canyon's standing as a national park was fought for unsuccessfully by John Muir when he was campaigning for Sequoia National Park's protection. Ansel Adams met greater success during the 1930s. 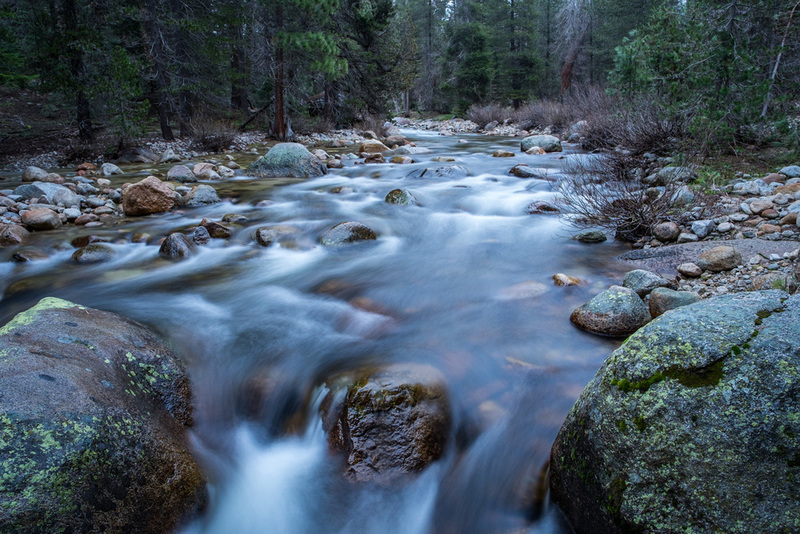 As a photographer for the Sierra Club, Adams created a collection of environmental photos showing the Kings River in the Sierra Nevada mountains that proved to be invaluable in convincing congress to protect the area as national parkland. 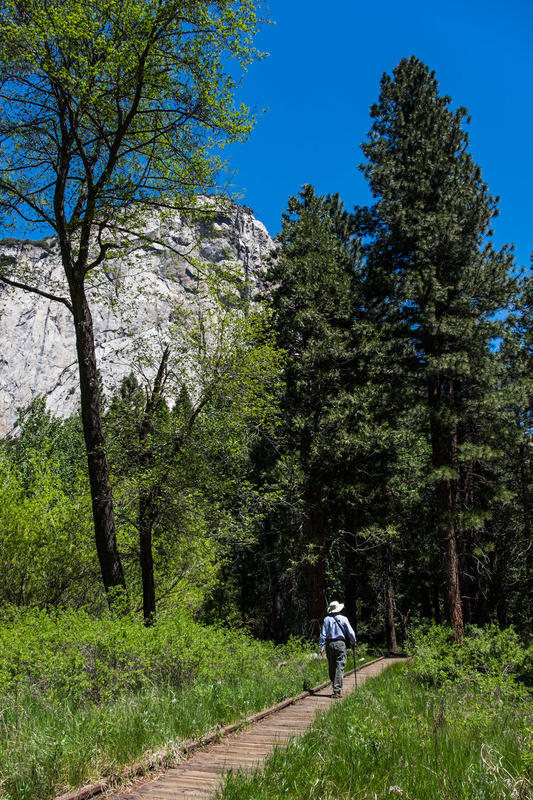 President Franklin Delano Roosevelt and Interior Secretary Harold Ickes were so moved by the subsequent limited edition book, Sierra Nevada: The John Muir Trail, that they established Kings Canyon as a national park in 1940. 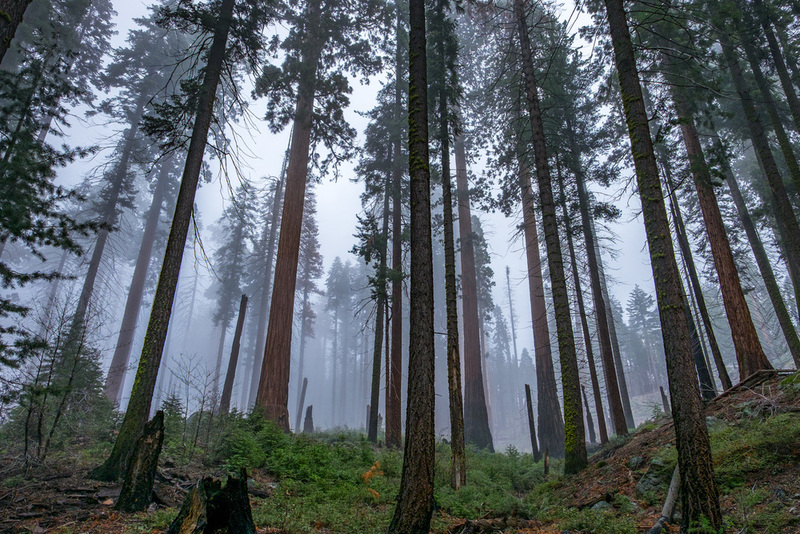 Massive sequoia groves are prone to forest fires. For a long time, putting out such fires became a trying and impossible task to the park service. 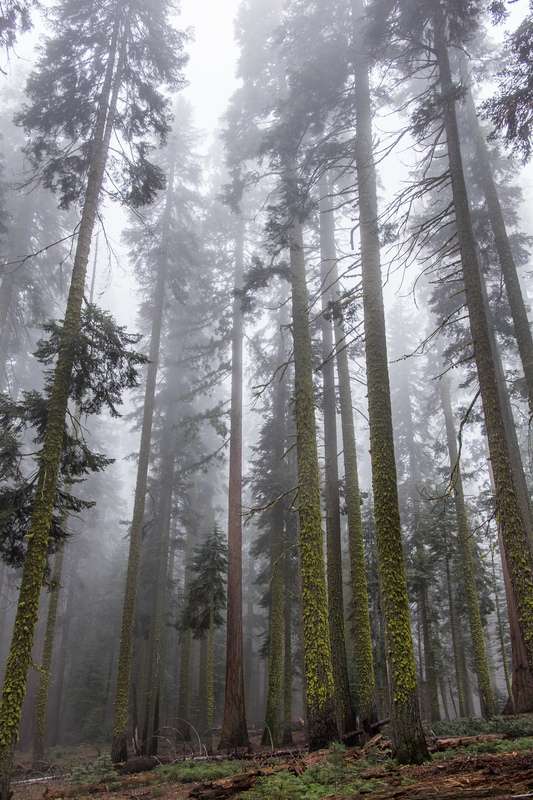 Those attempts proved to be unnecessary, as sequoia trees are not only well-adapted to survive fire but even need it to reproduce. 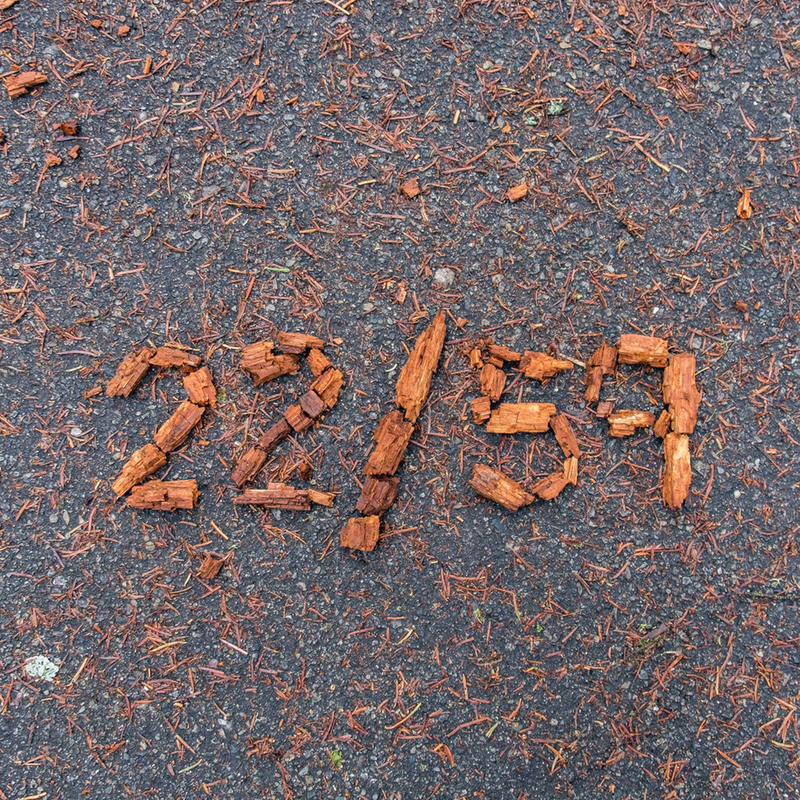 Fires, they say, clear away debris on the forest floor allowing space in bare mineral soil for young sequoias to grow. Good to know. Tunnel Log circa 1940. Credit: Library of Congress. 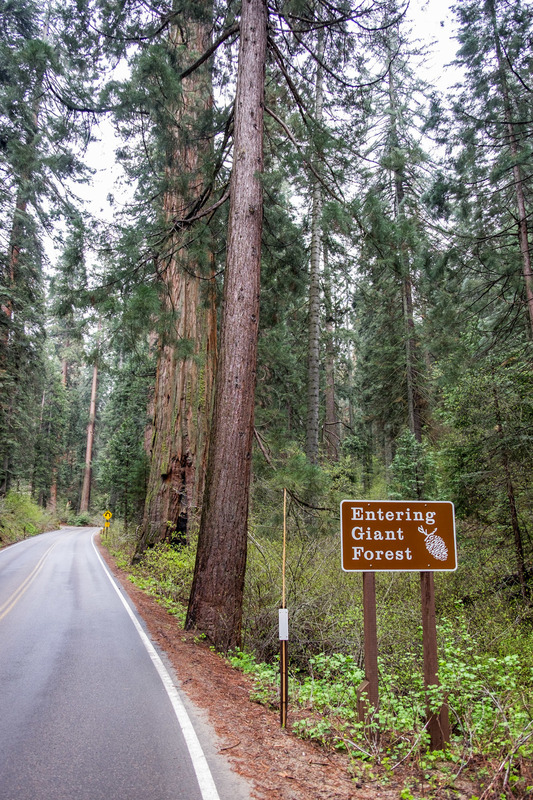 It was under the direction of Captain Charles Young in 1903, who at the time was the only African American officer in the U.S. Army, that the road into the Giant Forest was completed providing better access to the big trees by wagon. Mt. Whitney, standing at 14,505 feet, is the highest mountain in the lower 48 states and is located on the eastern side of Sequoia National Park. The Ash Mountain Entrance Sign (pictured right) at the foot of Sequoia National Park was designed and built in 1935 by a Civilian Conservation Corps enrollee. 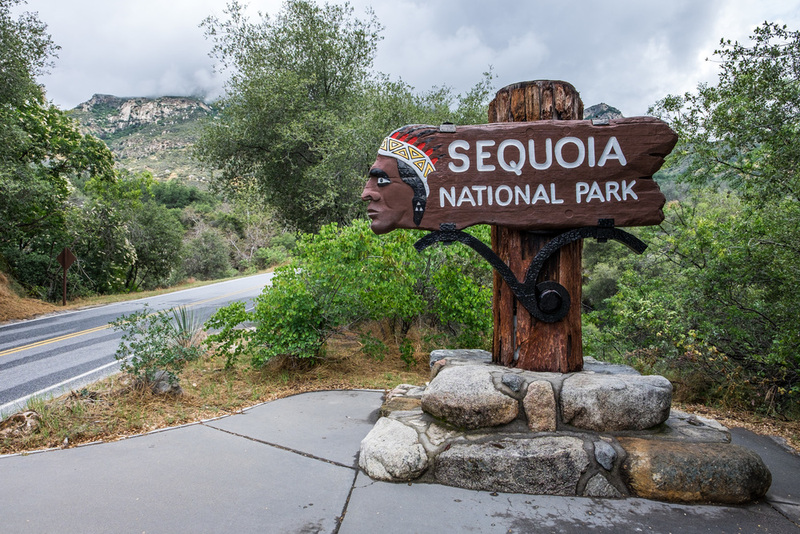 The sign, depicting a Sequoyah Indian, was carved from a large block of sequoia tree bark and modeled after an Indian Head nickel. Poison oak is common in the California wilderness. There are two easy-to-remember identifiers—the emerald green colored leaves have a shiny surface; and there are three leaves. A common saying that goes for most forested poisonous plants is: "leaves of three, let them be!" 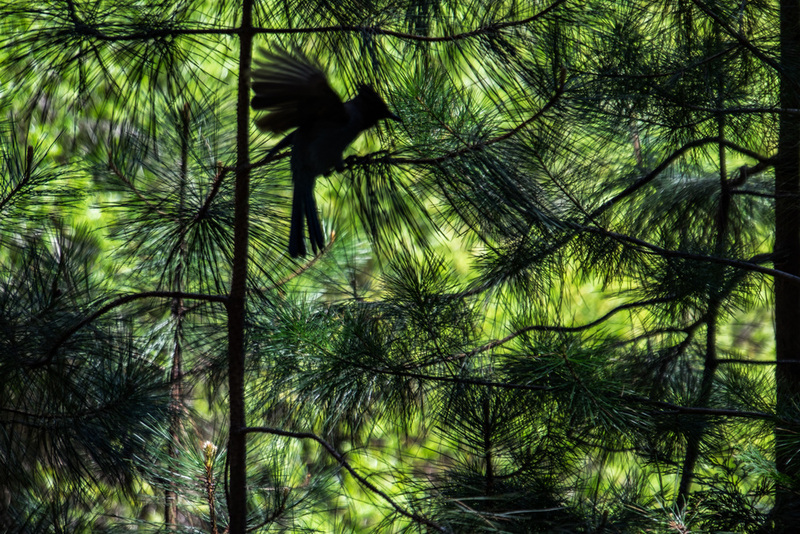 With diverse climate systems and elevations in Sequoia and Kings Canyon, wildlife species runs the gamut. 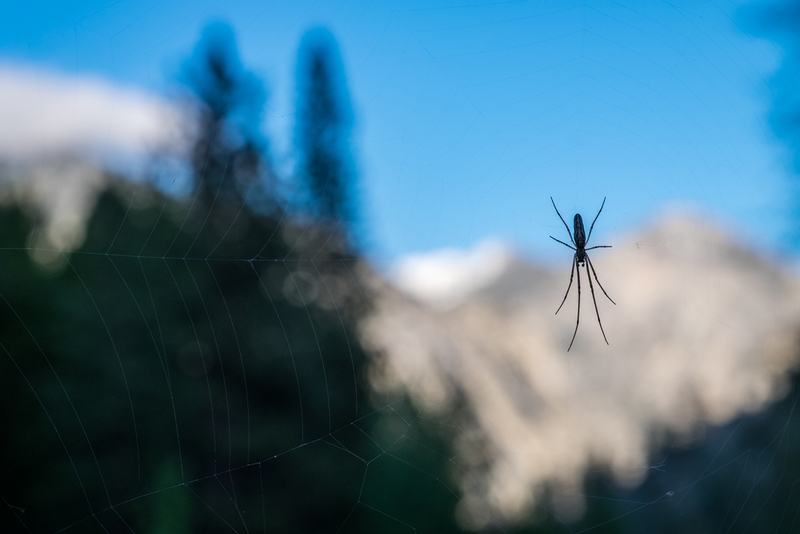 Some of what you might see: mountain lions (also known as pumas or panthers), black bears, foxes, skunks, snakes, deer, migratory birds, and Sierra Nevada big horn sheep. In order to assure that an increasing population, accompanied by expanding settlement and growing mechanization, does not occupy and modify all areas within the United States and its possessions, leaving no lands designated for preservation and protection in their natural condition, it is hereby declared to be the policy of the Congress to secure for the American people of present and future generations the benefits of an enduring resource of wilderness.